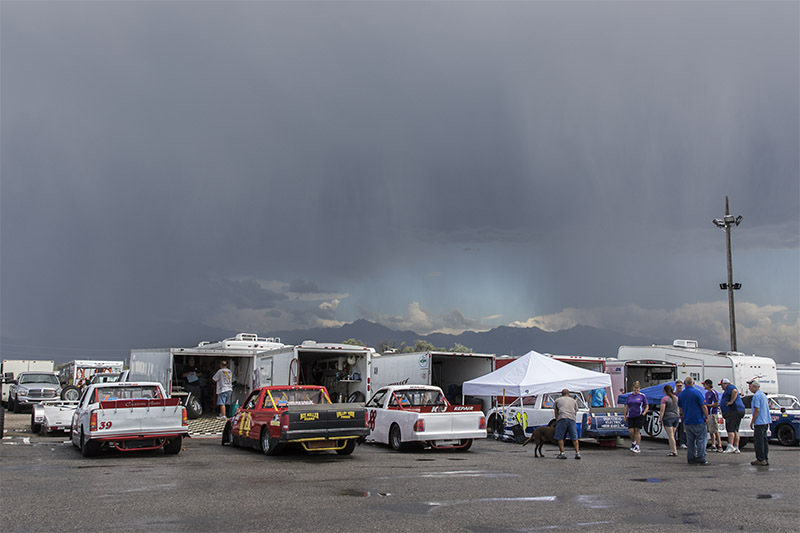 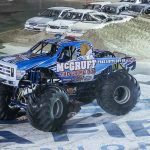 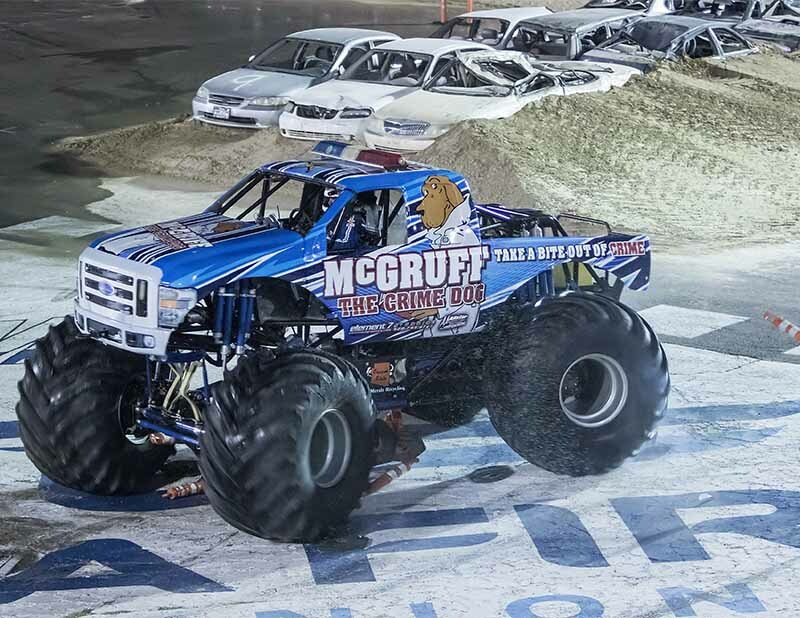 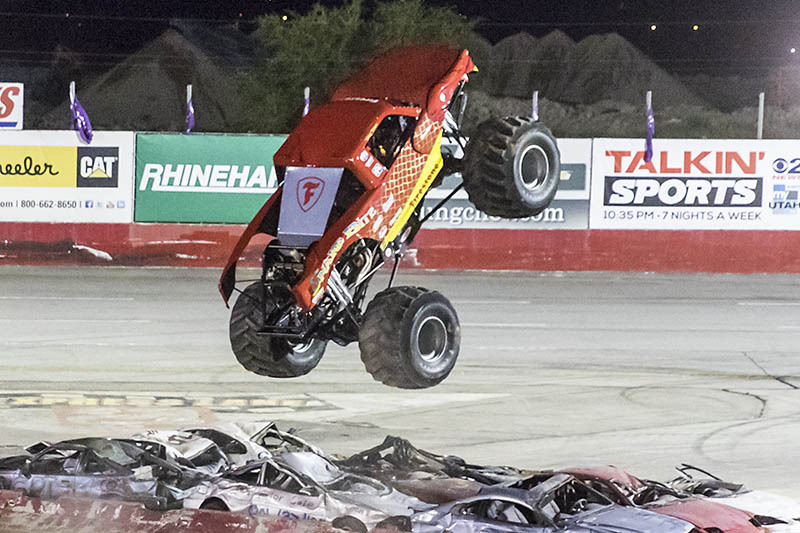 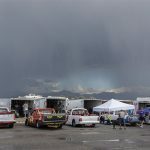 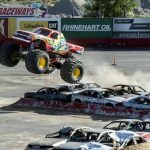 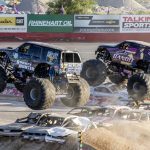 This time on “The Allen Report”, we look back to the end of last year, when a familiar sight returned to the Arizona State Fairgrounds with an interesting twist. 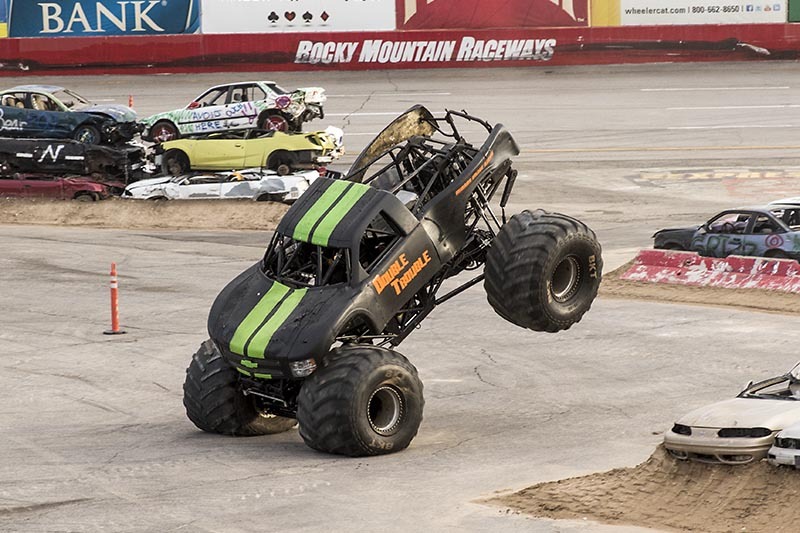 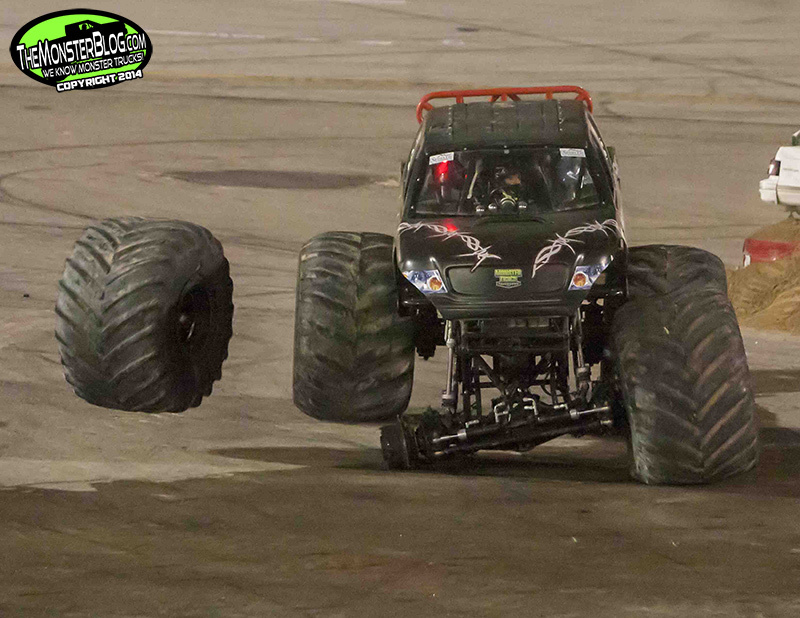 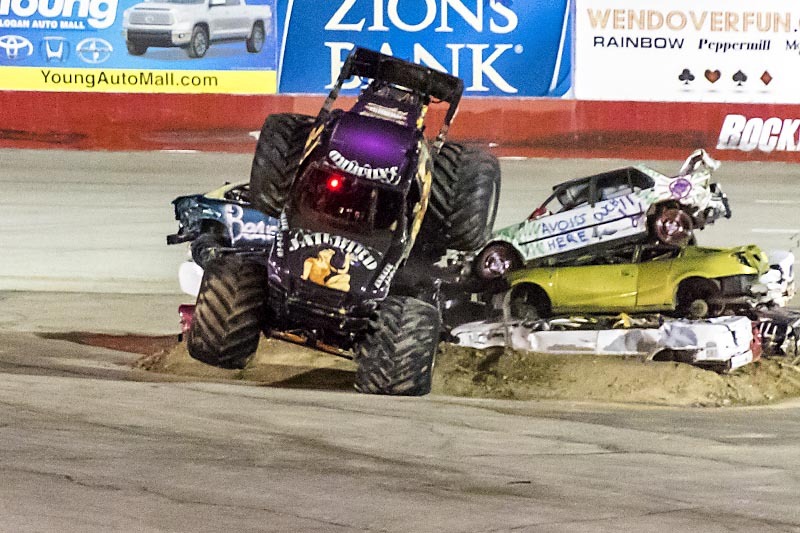 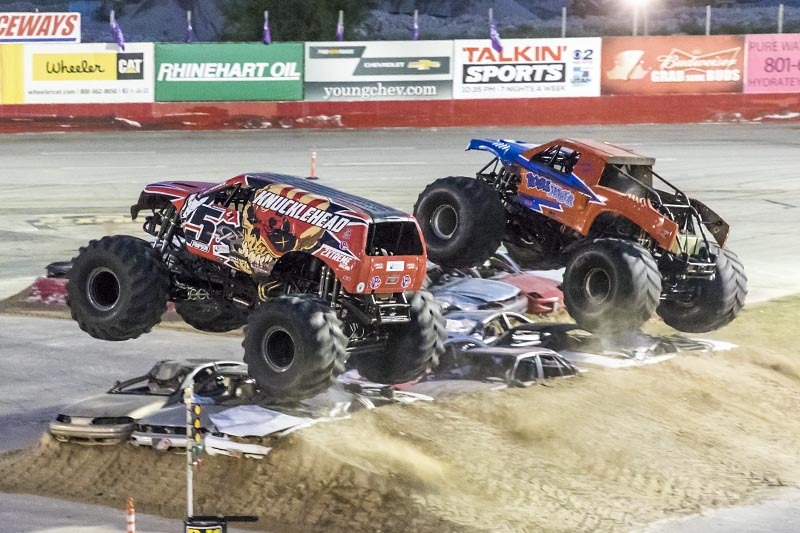 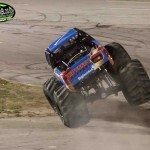 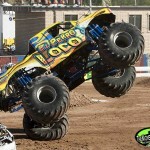 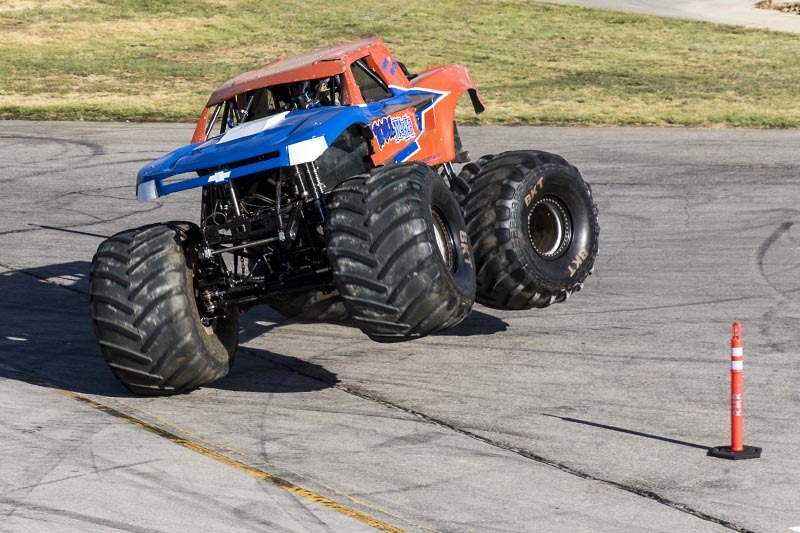 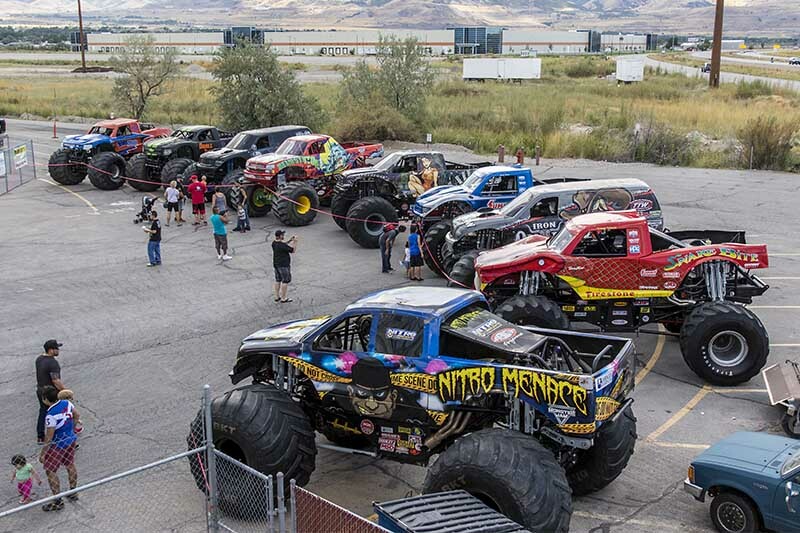 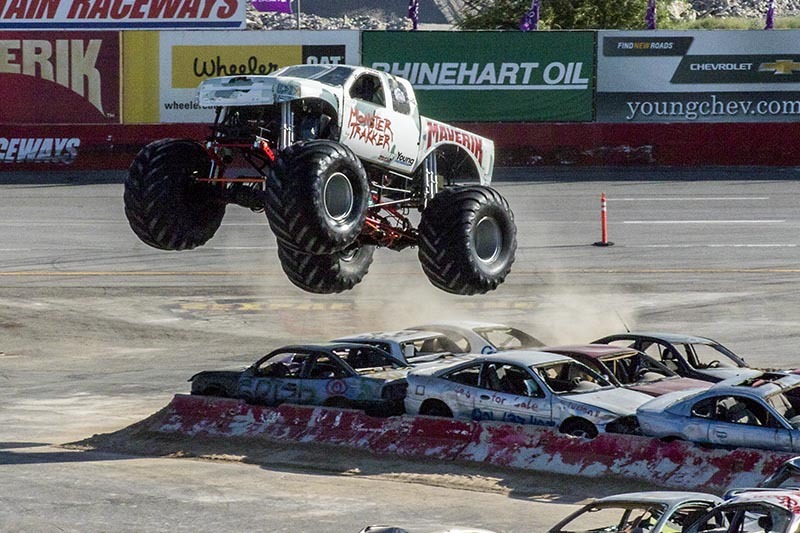 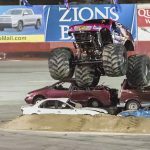 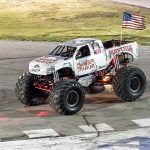 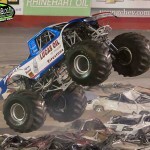 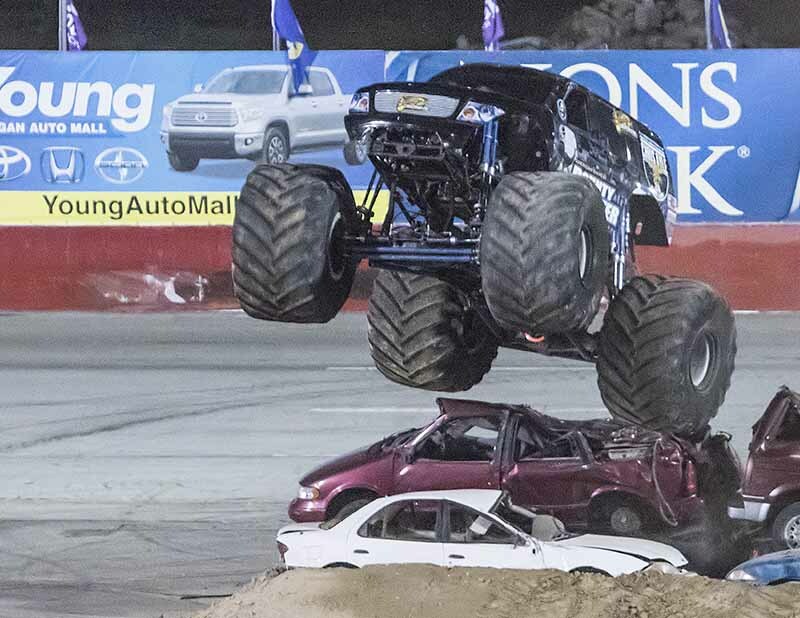 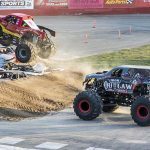 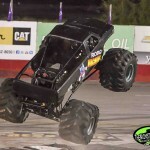 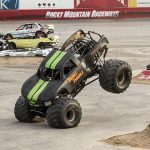 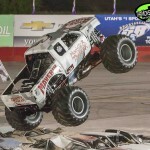 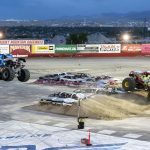 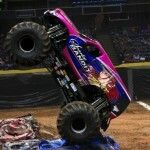 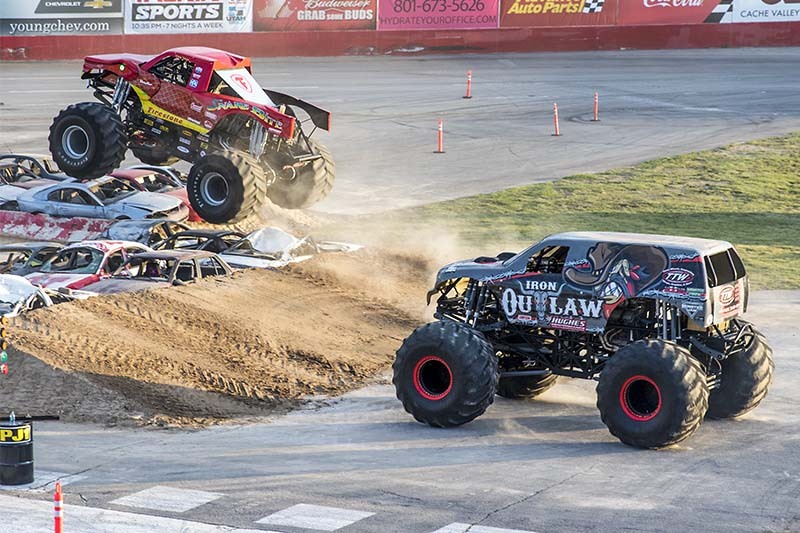 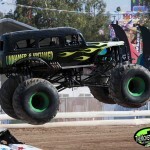 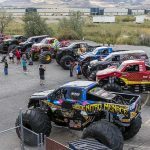 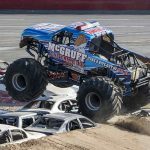 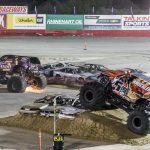 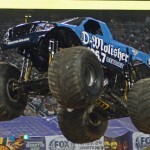 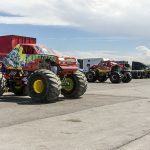 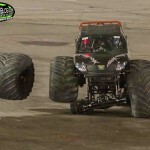 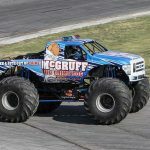 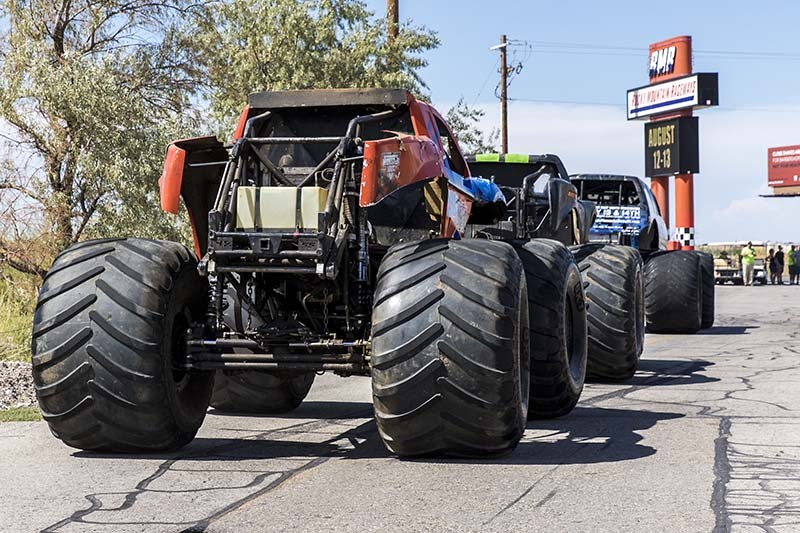 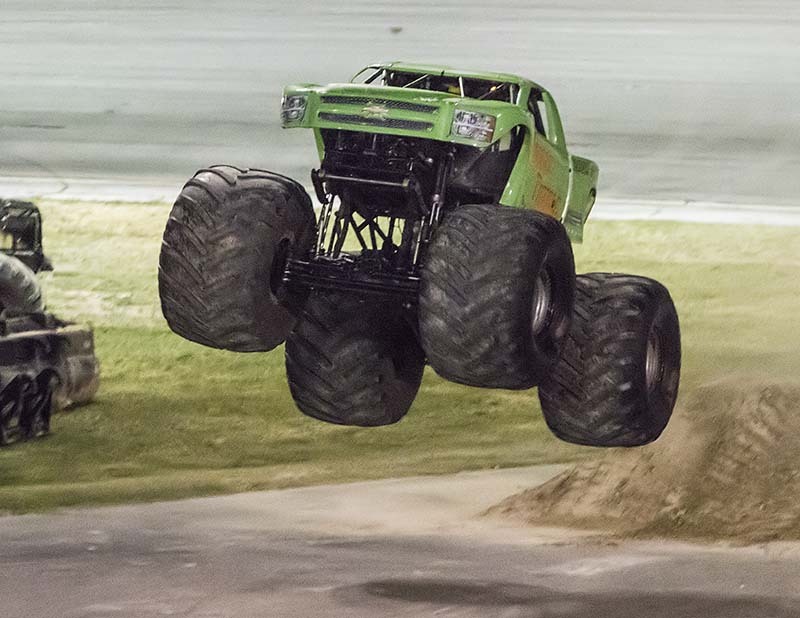 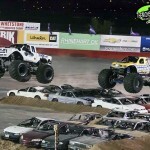 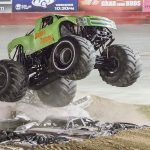 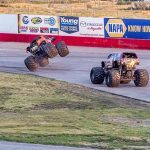 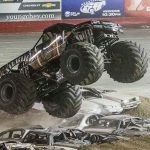 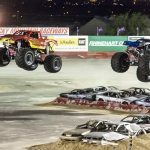 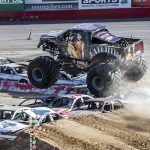 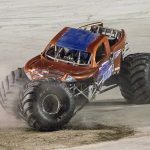 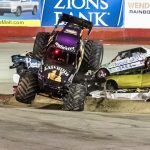 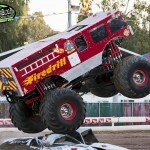 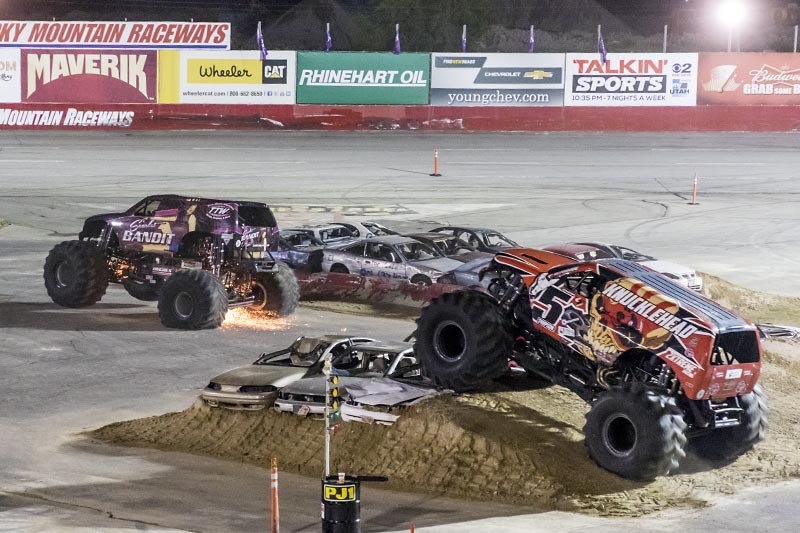 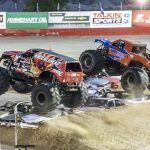 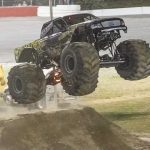 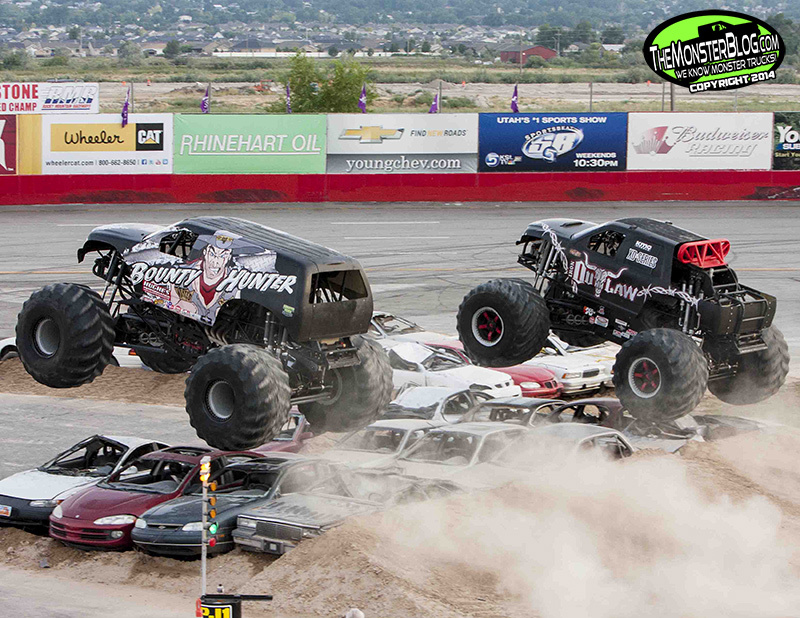 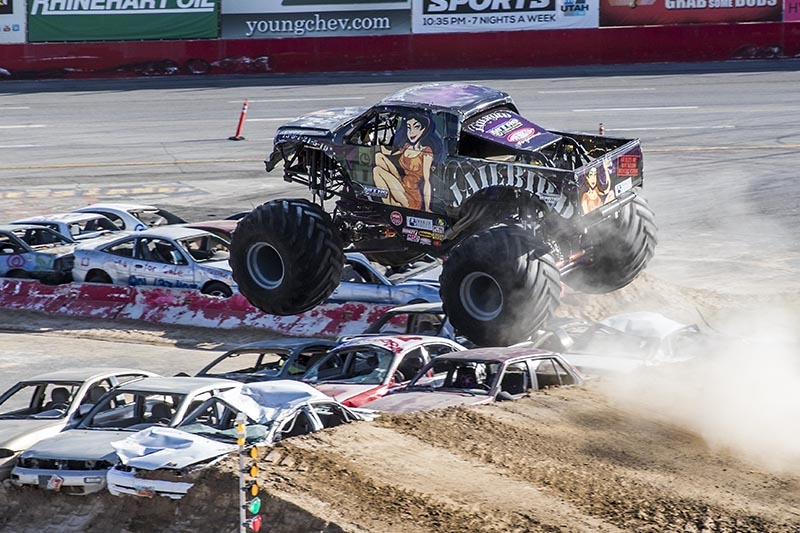 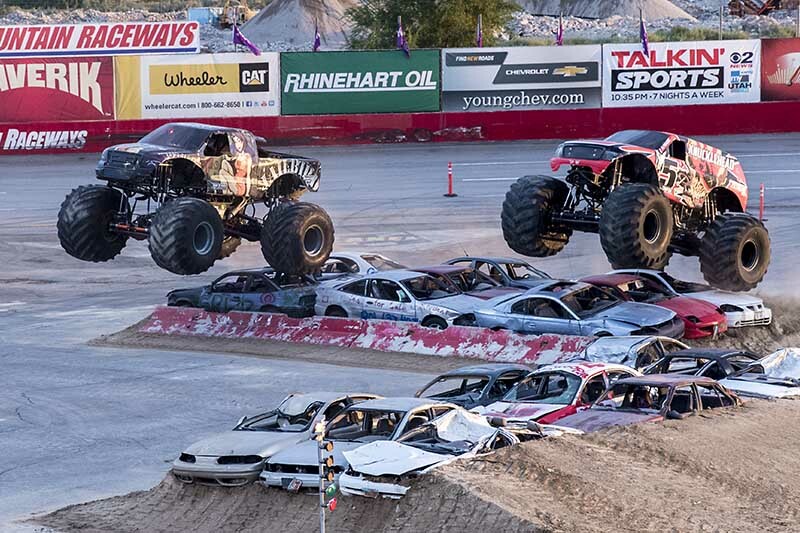 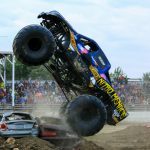 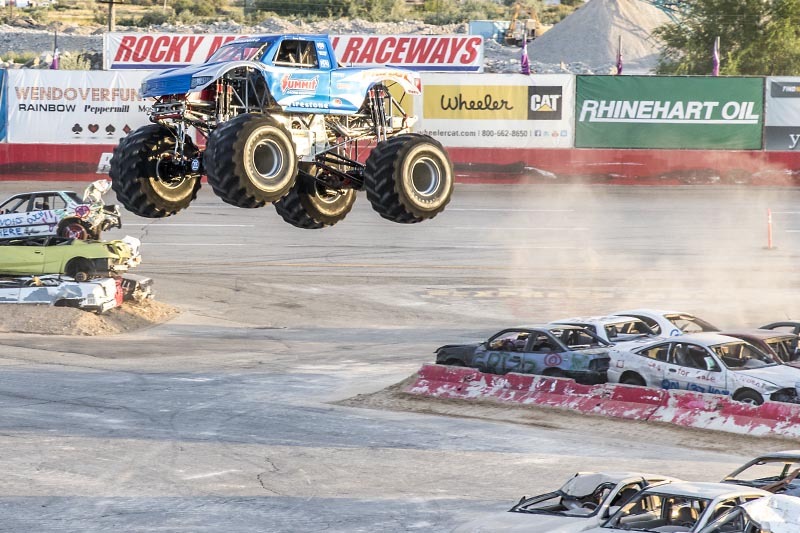 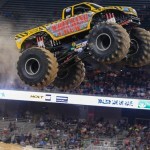 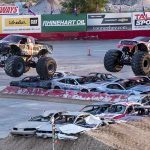 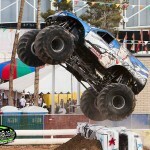 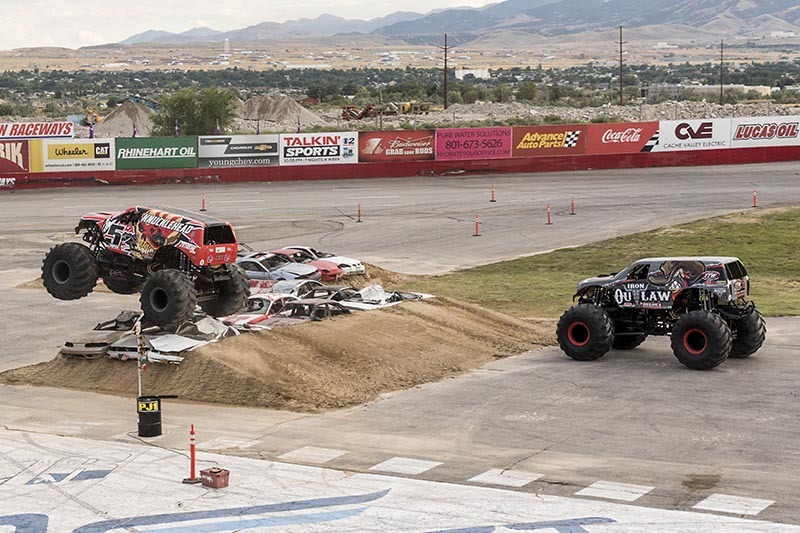 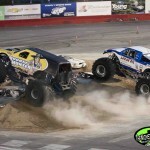 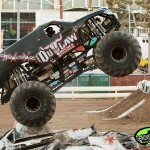 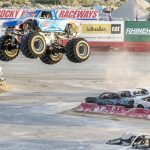 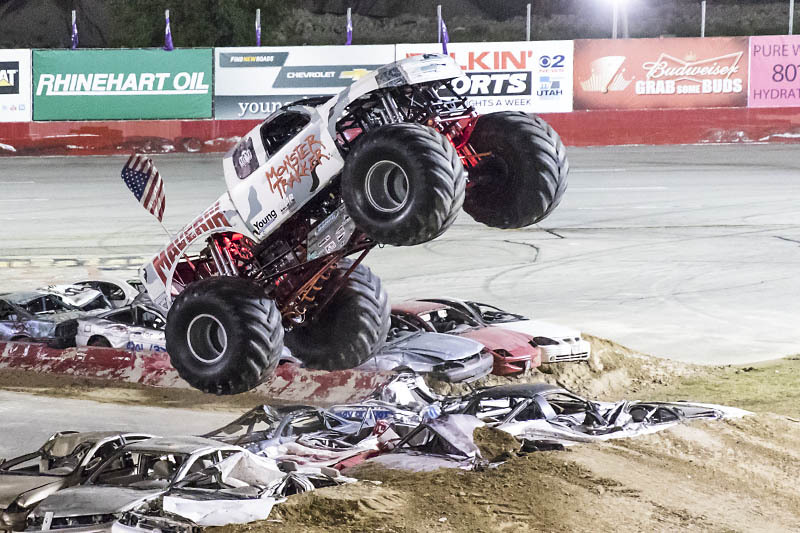 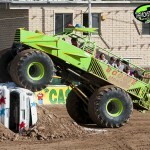 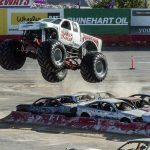 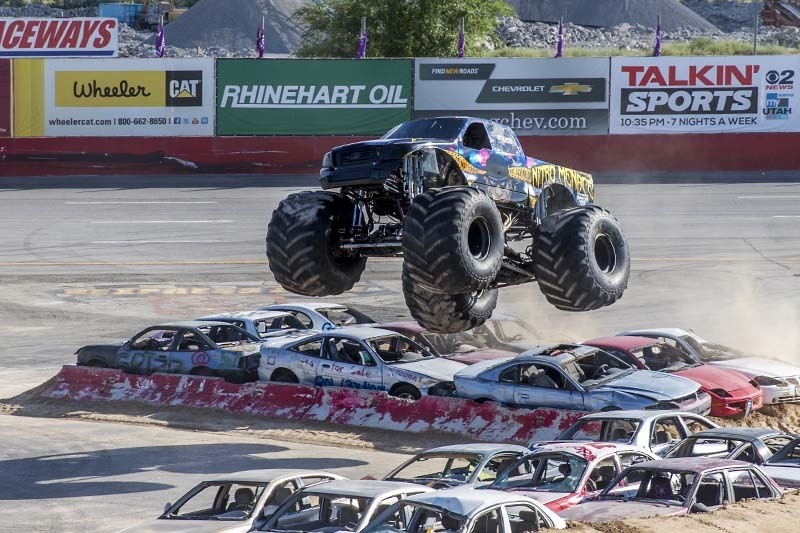 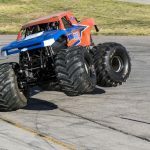 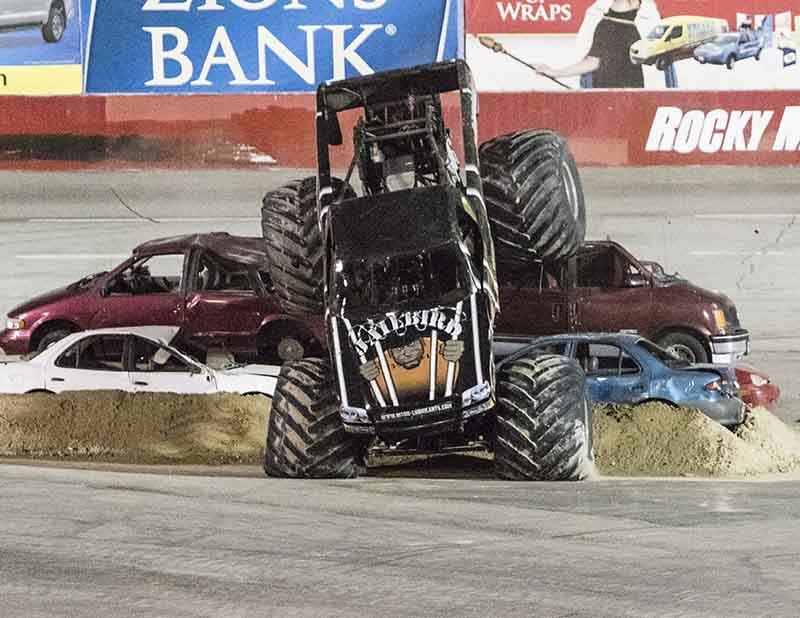 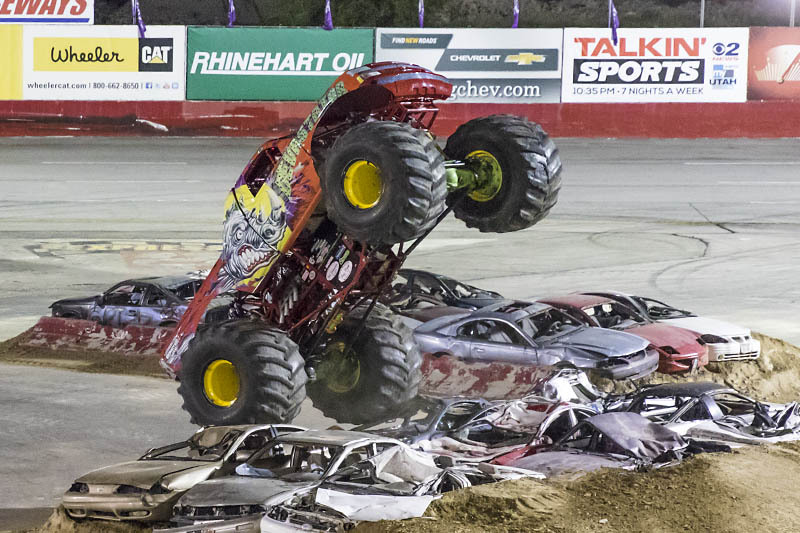 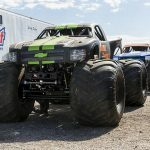 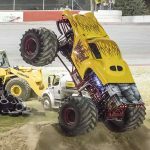 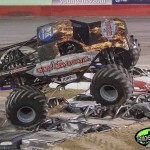 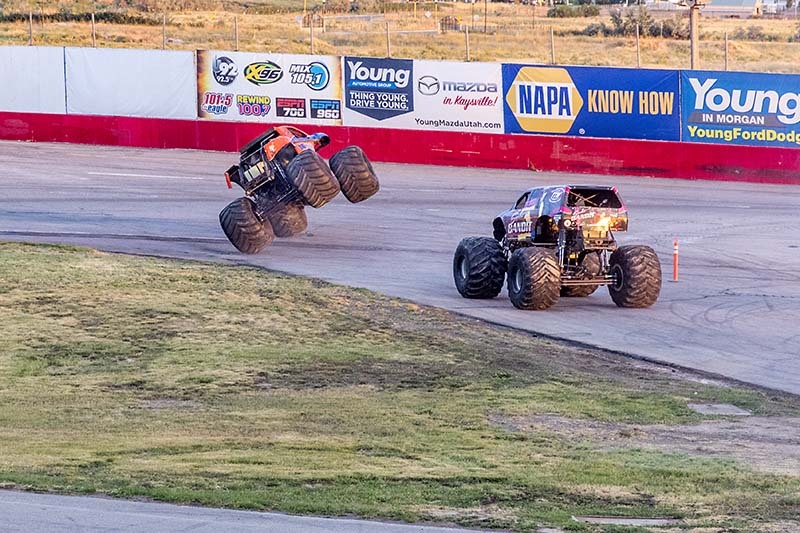 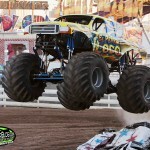 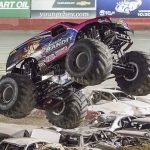 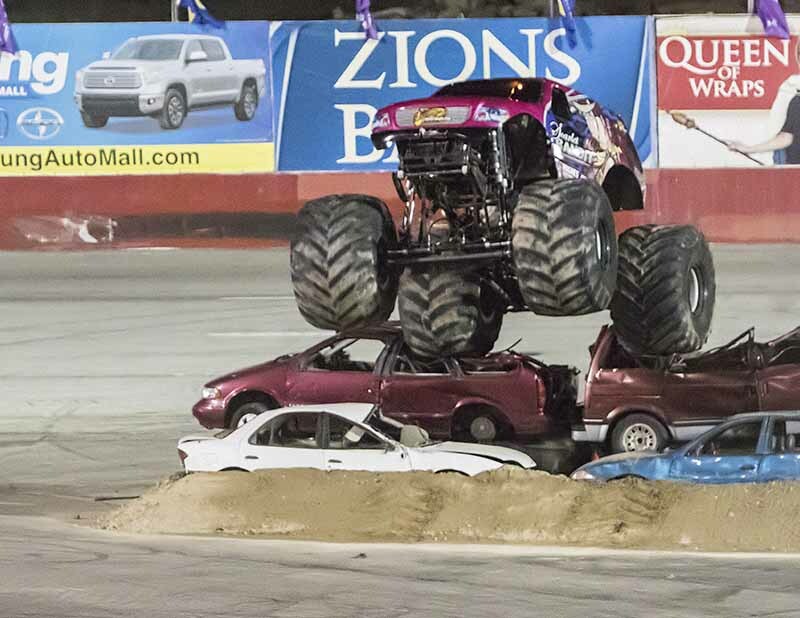 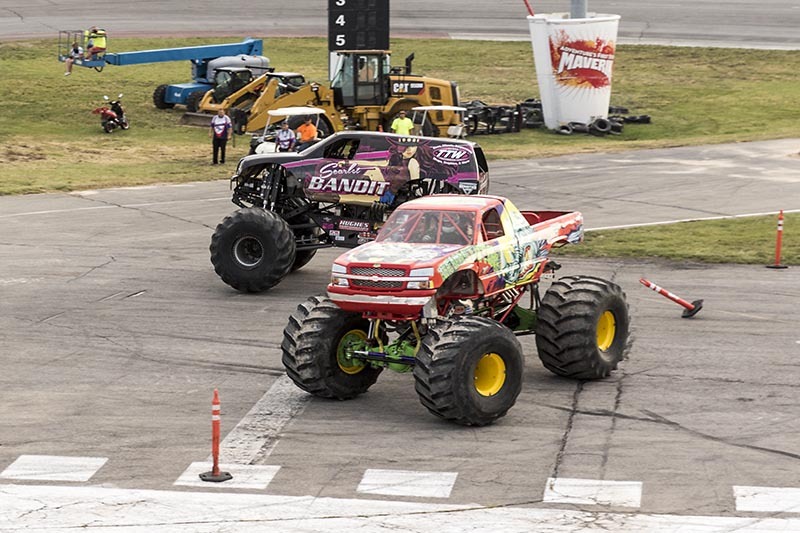 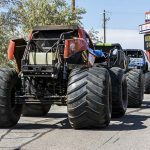 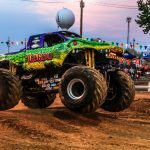 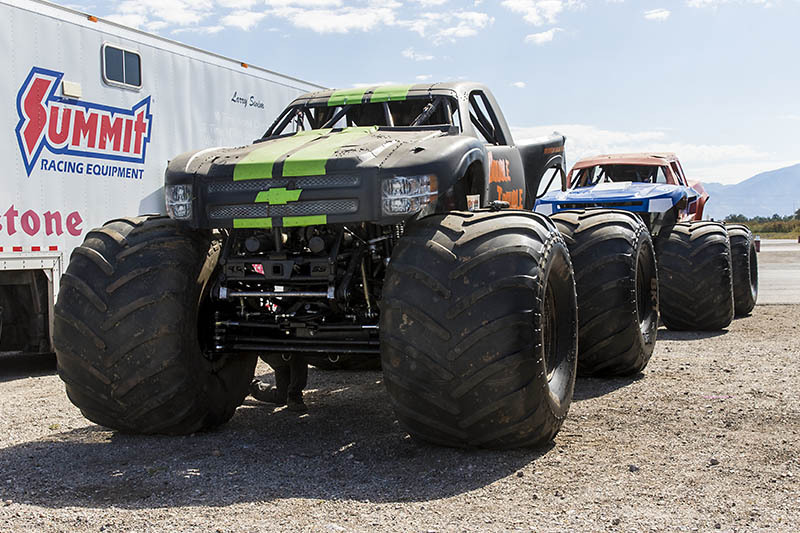 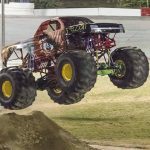 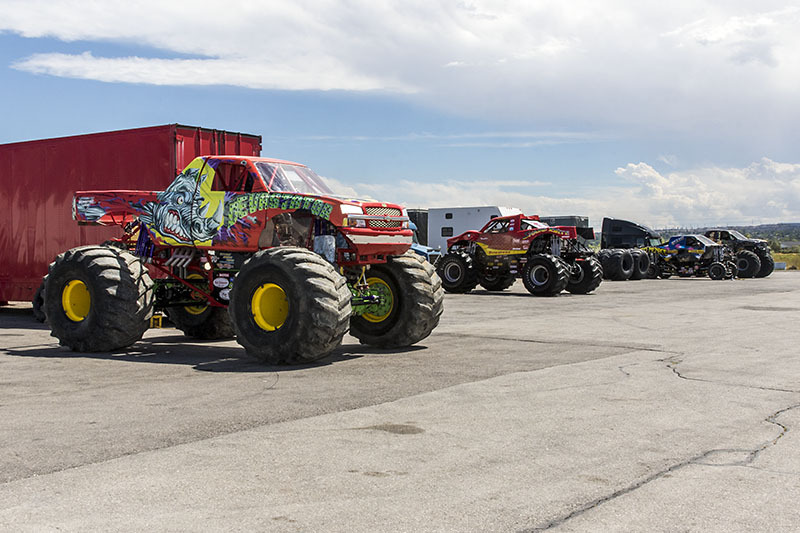 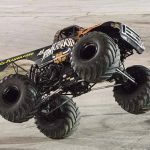 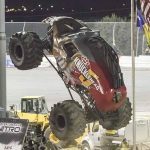 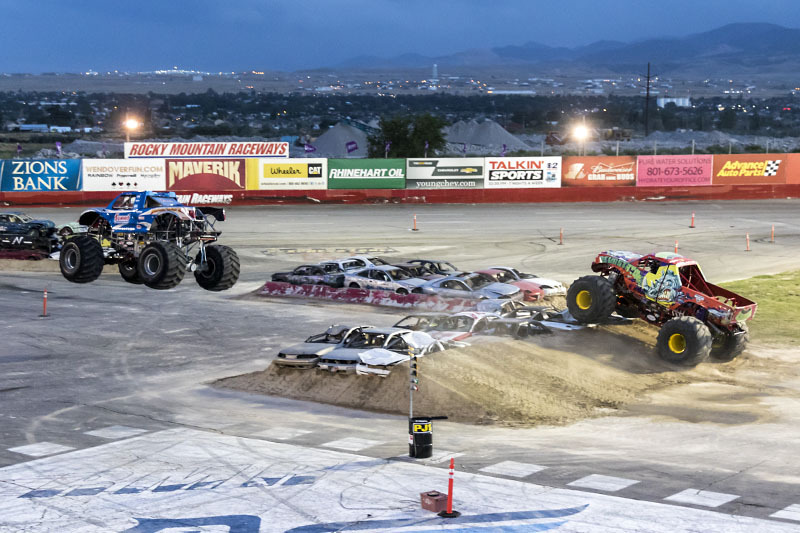 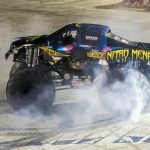 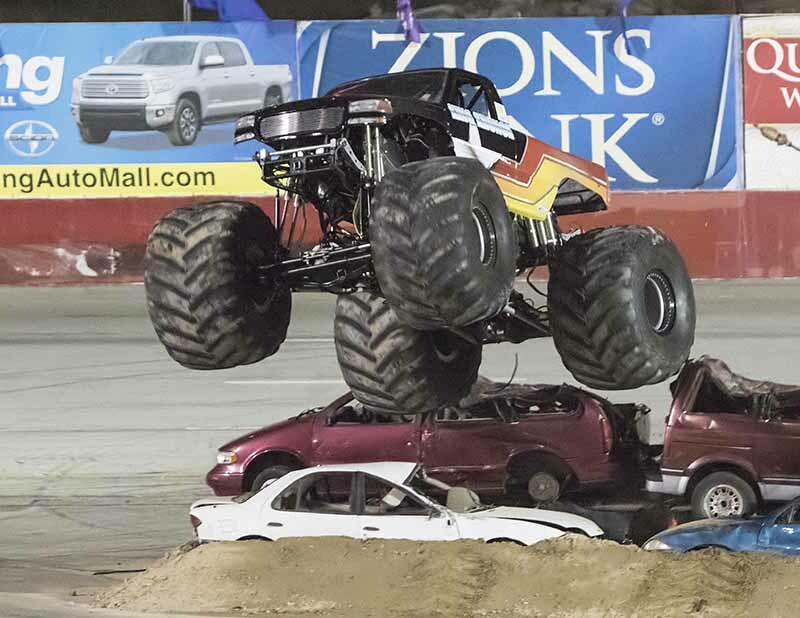 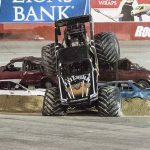 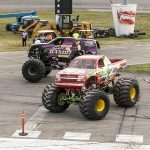 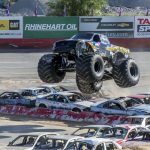 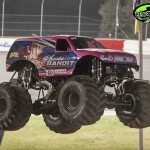 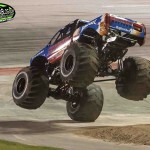 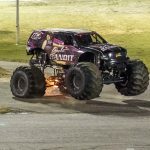 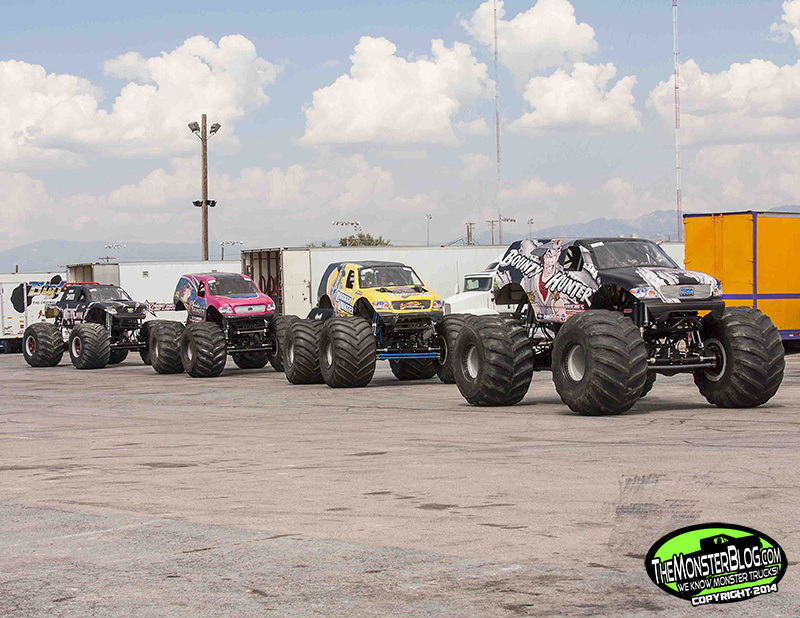 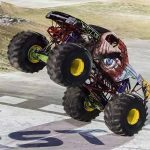 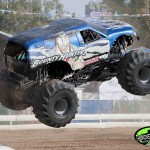 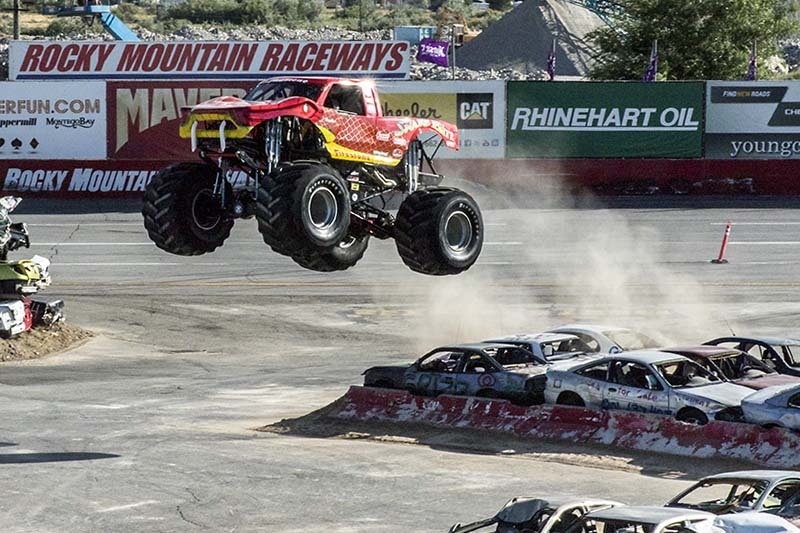 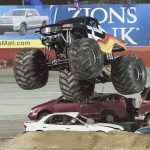 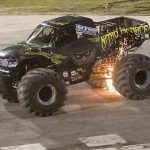 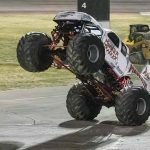 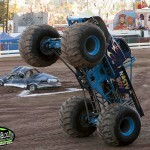 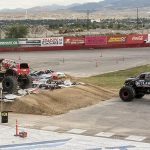 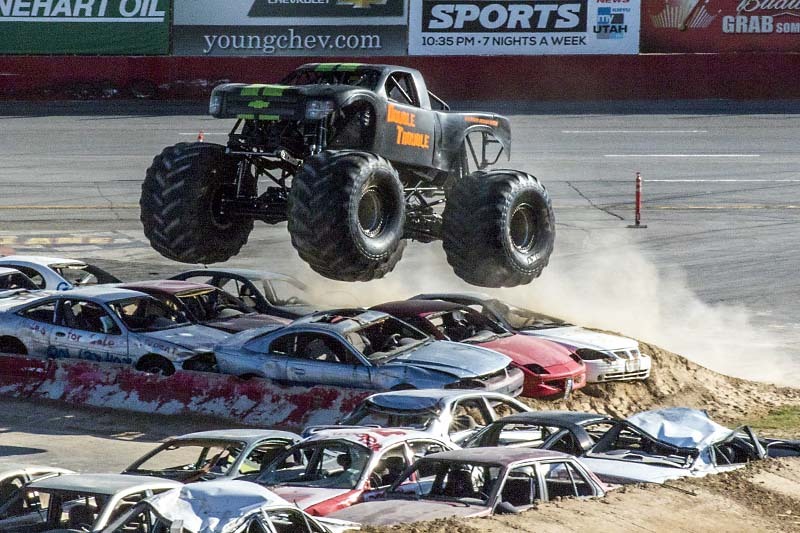 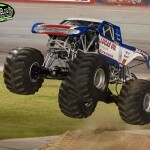 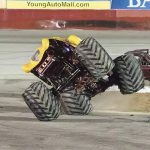 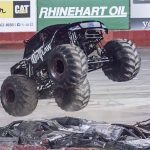 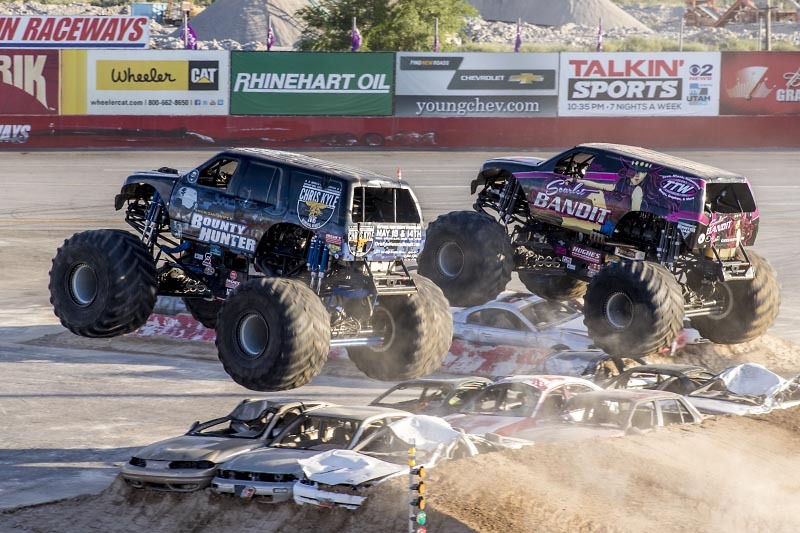 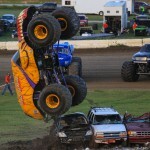 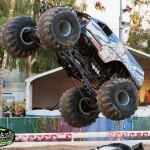 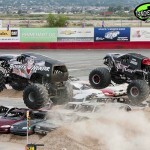 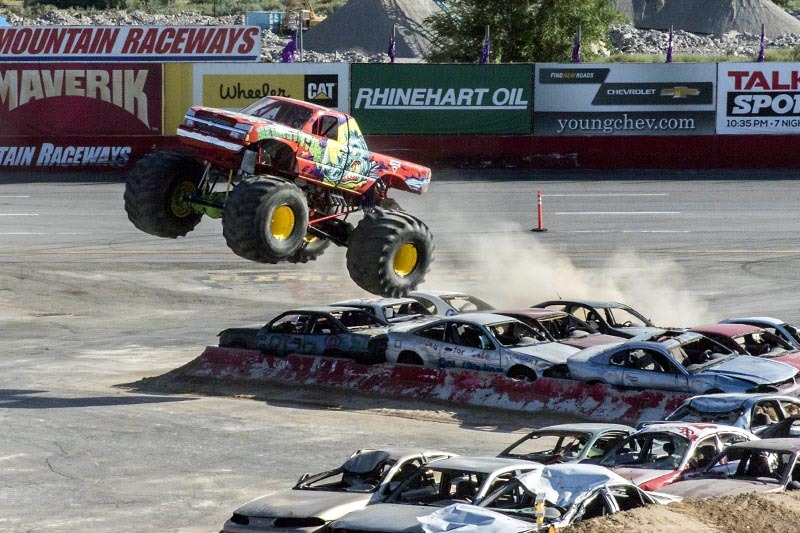 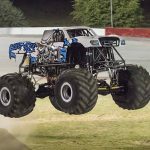 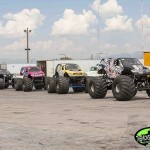 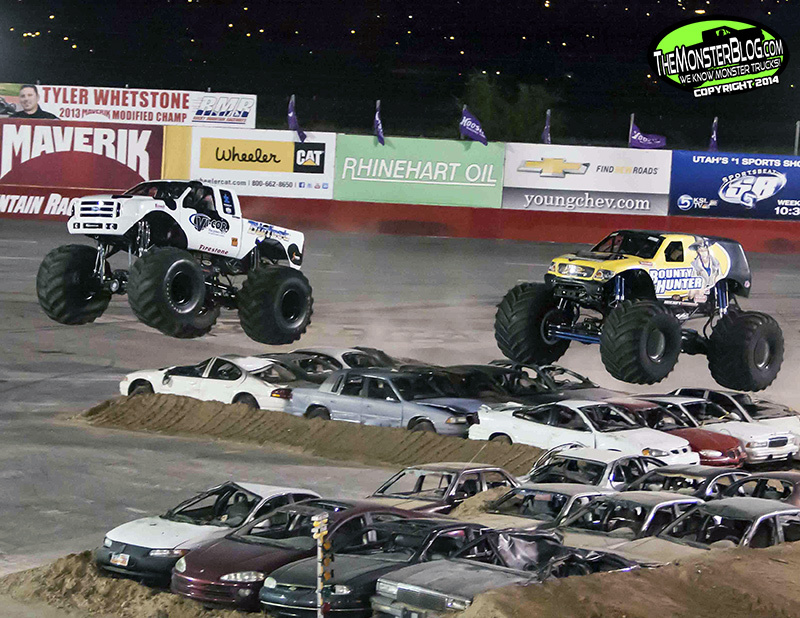 Six monster trucks arrived over the first weekend of November. 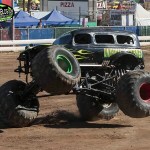 However, both halves of the field would be split into different shows over the weekend. 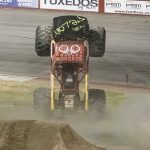 Six shows happened over the three days. 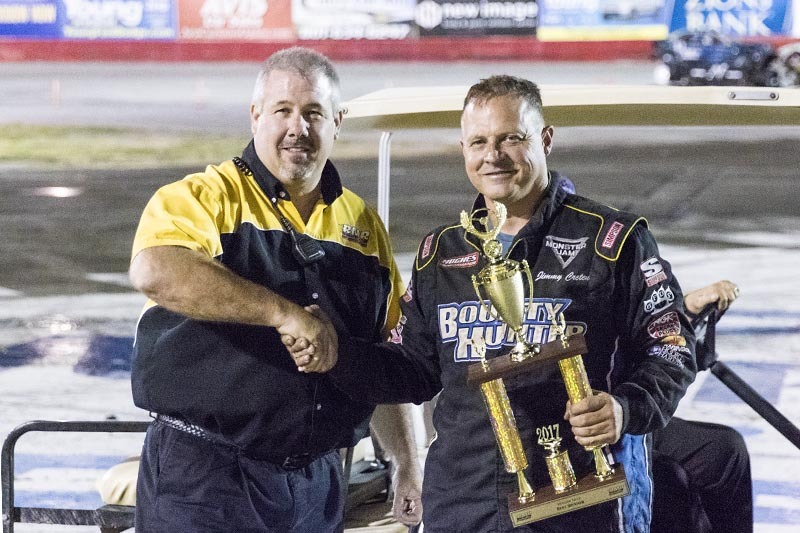 Every win was rewarded with points. 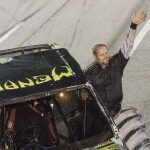 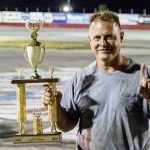 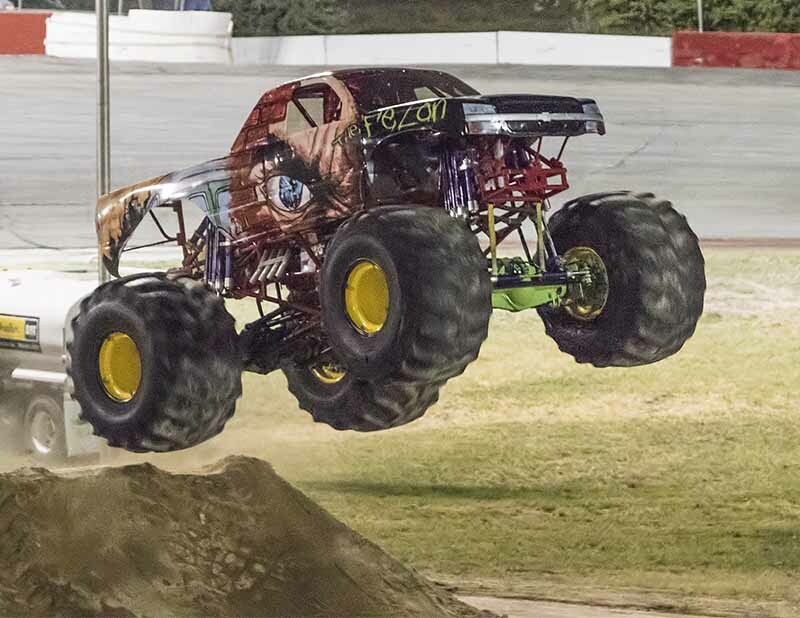 Shows number one, three and five starred Rod Wood in El Perro Loco, Nasty Boy piloted by Travis Sturges and team owner Sam Sturges back in Unnamed and Untamed. 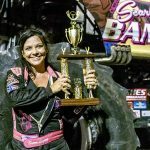 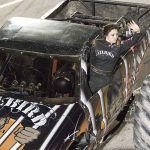 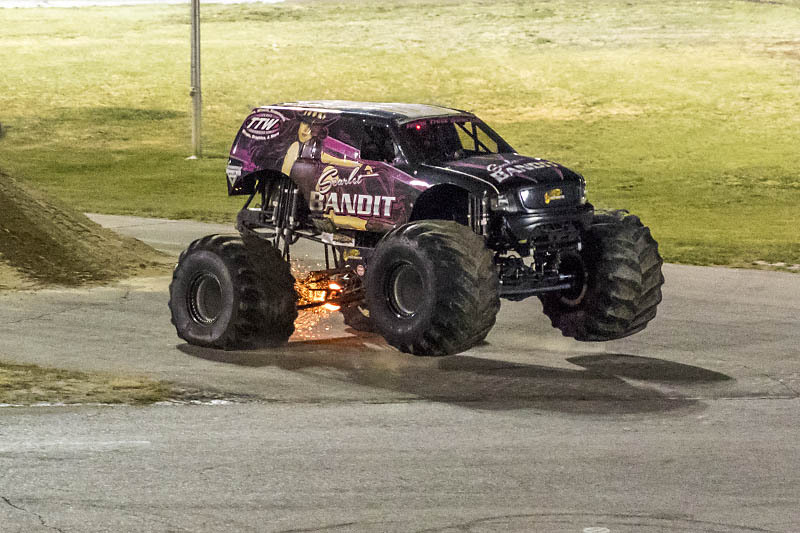 All the other performances showcased Jimmy Lyons in Firedrill, Dawn Creten in control of Iron Outlaw and Darren Migues behind the wheel of Bounty Hunter. 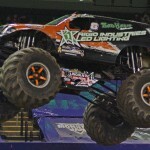 In the first group of shows, Rod Wood had increasingly higher competition. 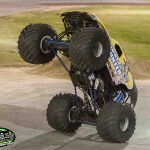 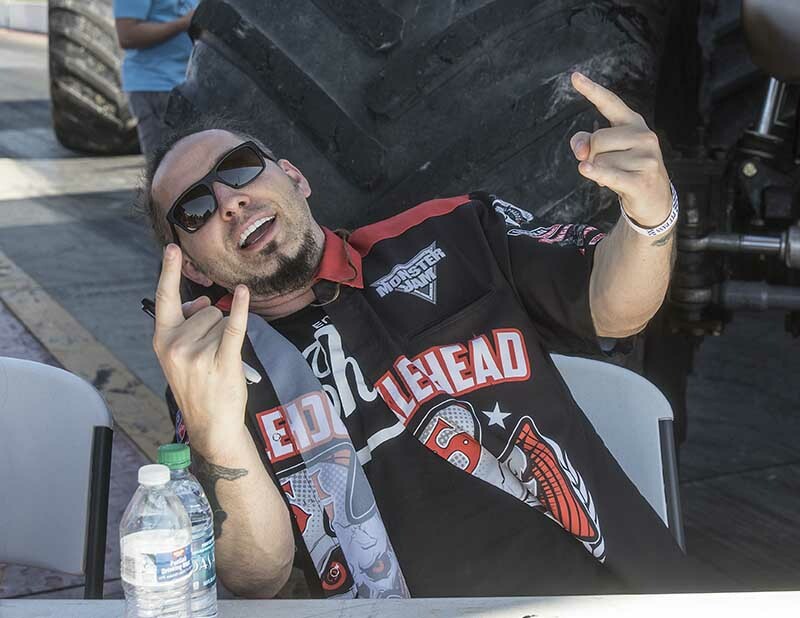 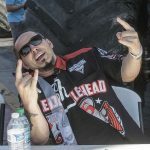 He started his weekend with a clean sweep of wheelie contest, S-track obstacle course racing and freestyle on Friday. 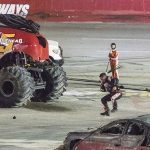 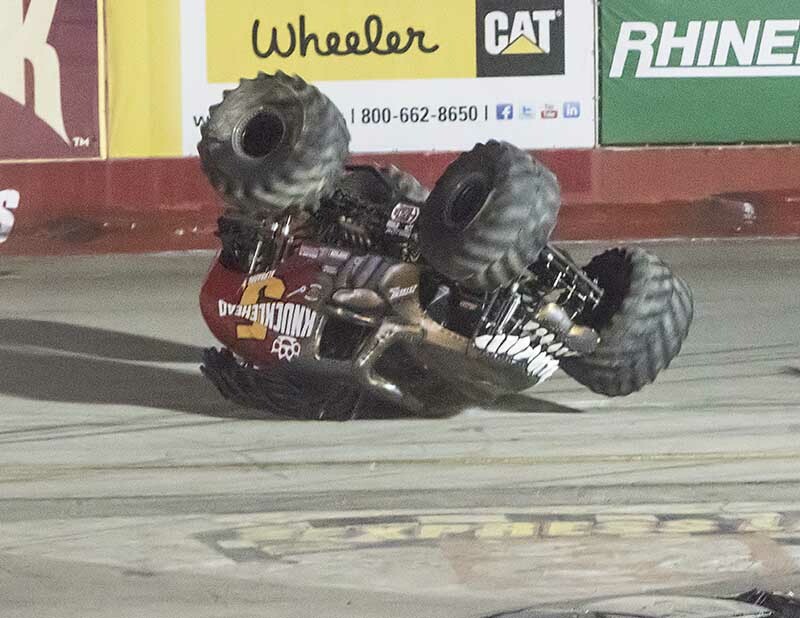 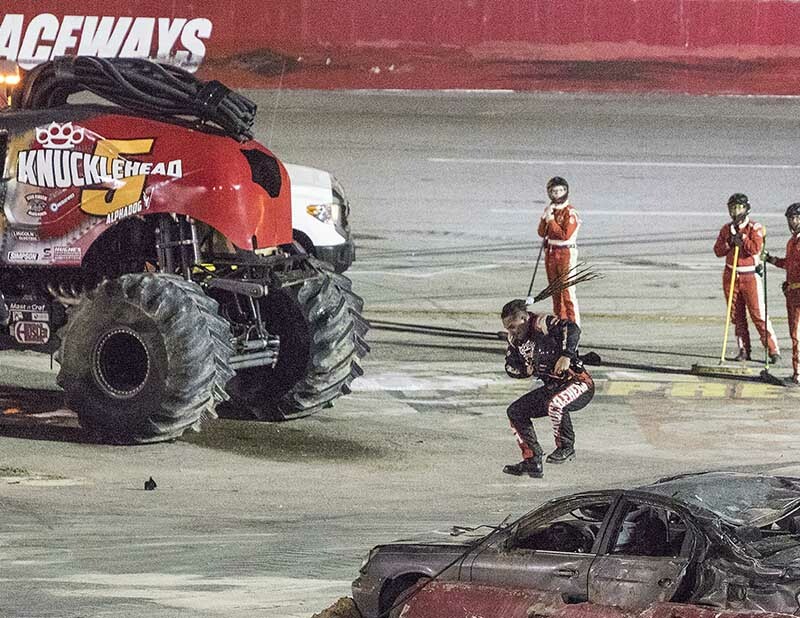 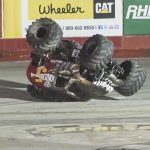 His opponents started to catch up when Nasty Boy got a win in wheelies, only to have his right front tire snap off upon landing. 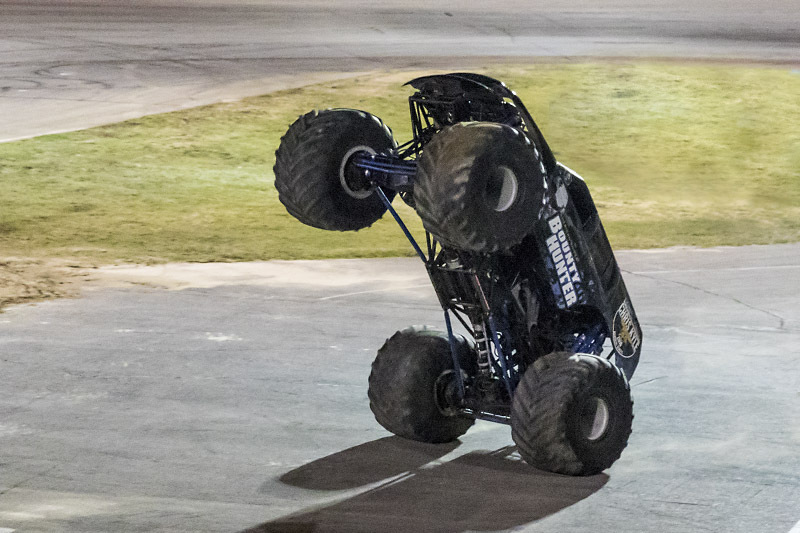 Undeterred by the snap of his streak, Rod just started another, winning both obstacle course and freestyle to maintain his lead. 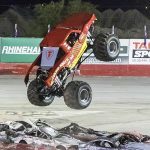 But when Sunday arrived, Nasty Boy shed off the pit rust quickly, winning both of the first two competitions before the Crazy Dog finally got his groove back with a 27 point win in freestyle. 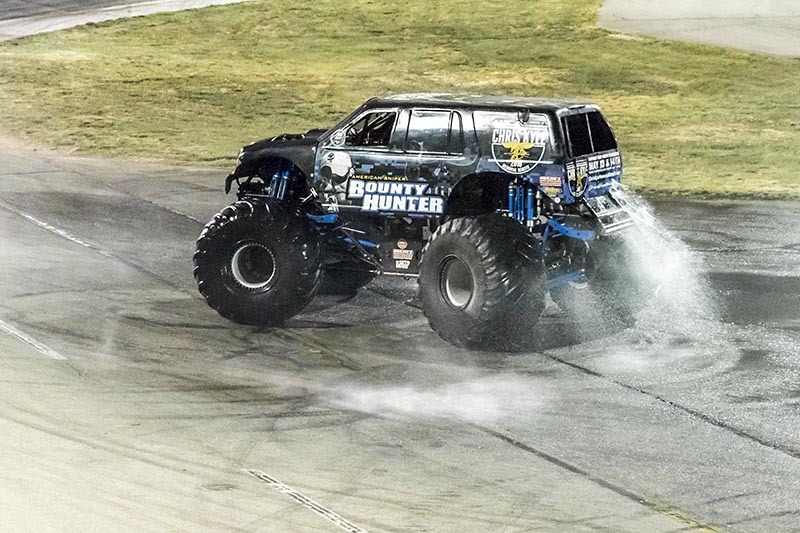 Over in the other group, Bounty Hunter continued the game of “anything you can do, I can do” by duplicating Rod Wood’s clean sweep in his group’s first show. 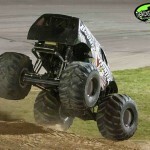 That evening, Darren started to do the same with a win in wheelies. 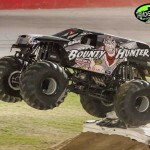 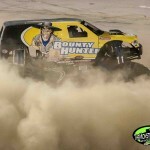 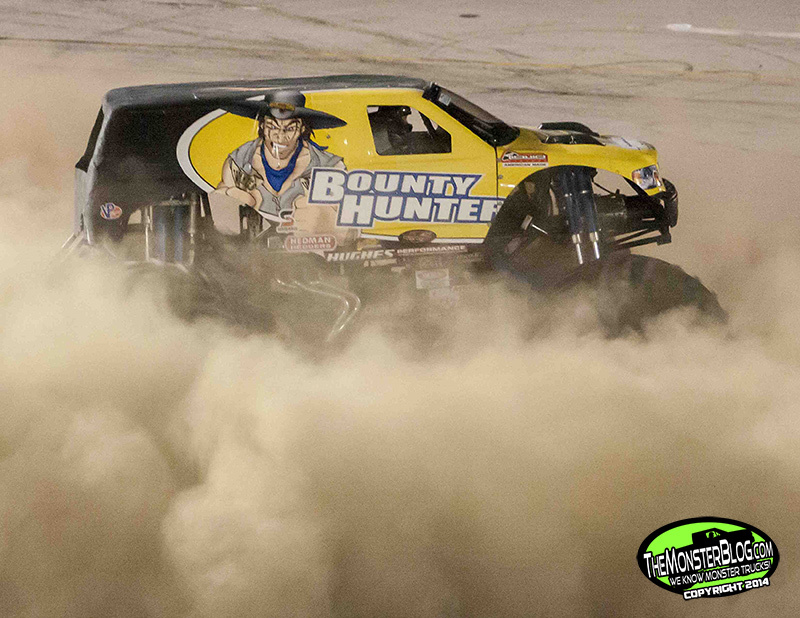 But in obstacle course, Bounty Hunter suddenly shut off with the finish line just ahead, giving the win to Iron Outlaw. 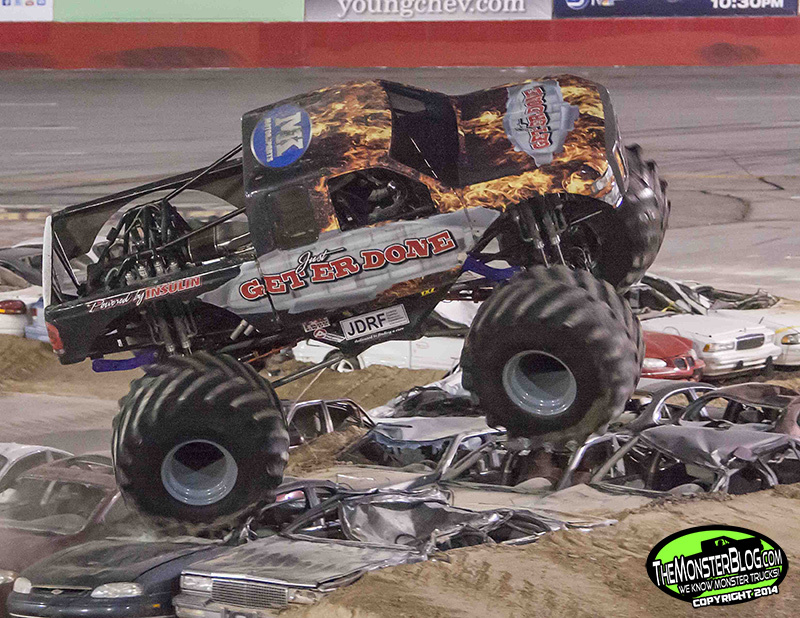 Darren Migues had everyone on notice in freestyle with an exciting run. 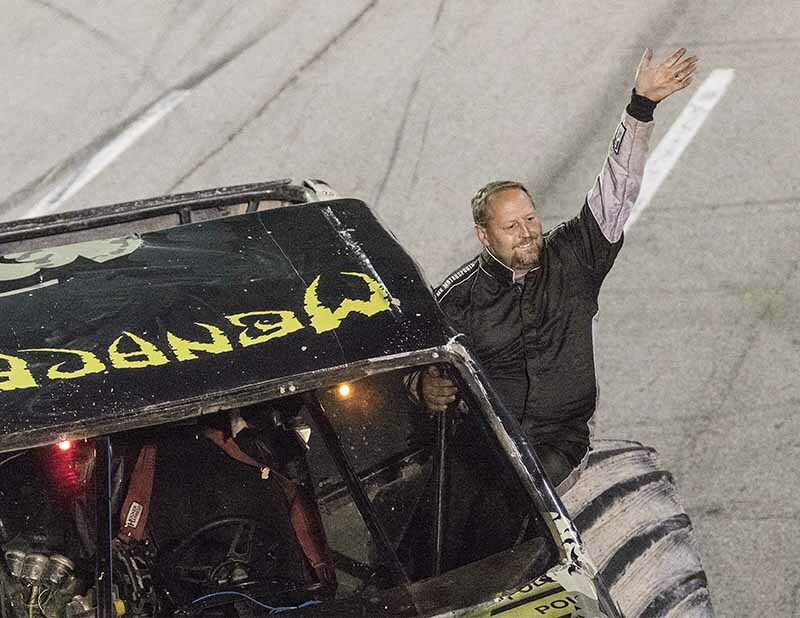 But he could only tie with Dawn Creten. 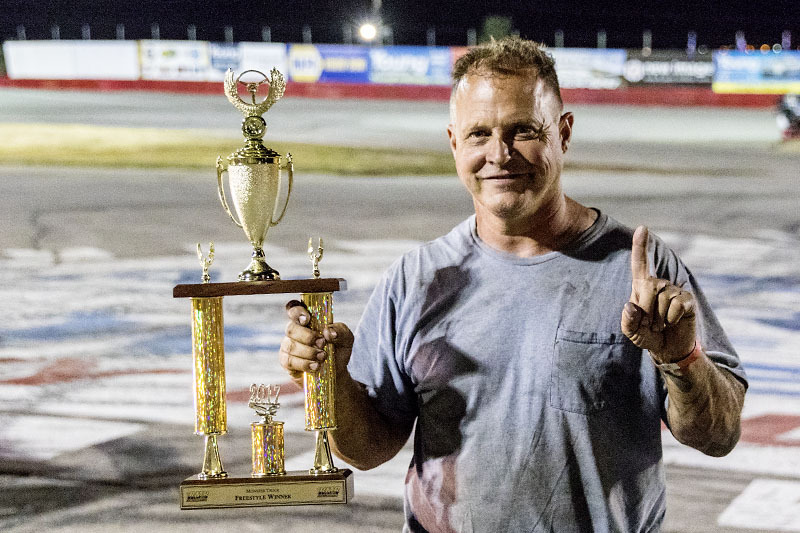 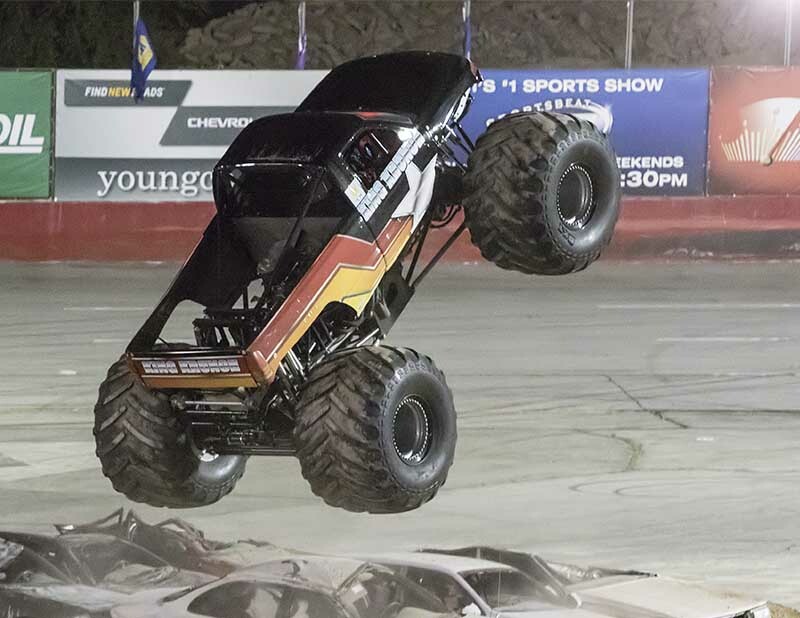 In the weekend’s final show, Jimmy Lyons finally found his winning wheelies, even with only rear wheel drive. 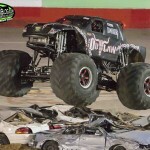 But Darren Migues won in obstacle course and laid it all out in his final freestyle. 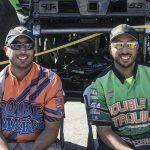 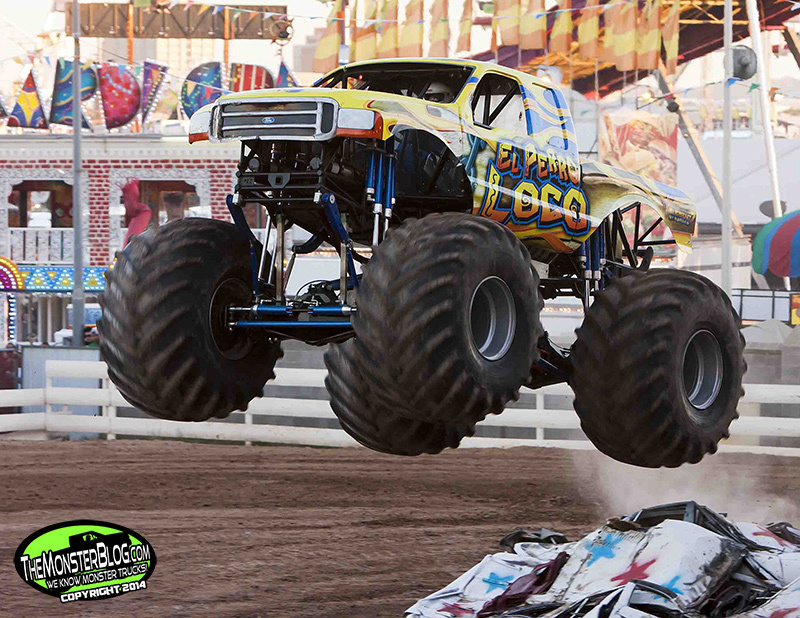 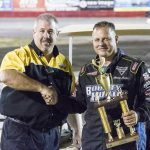 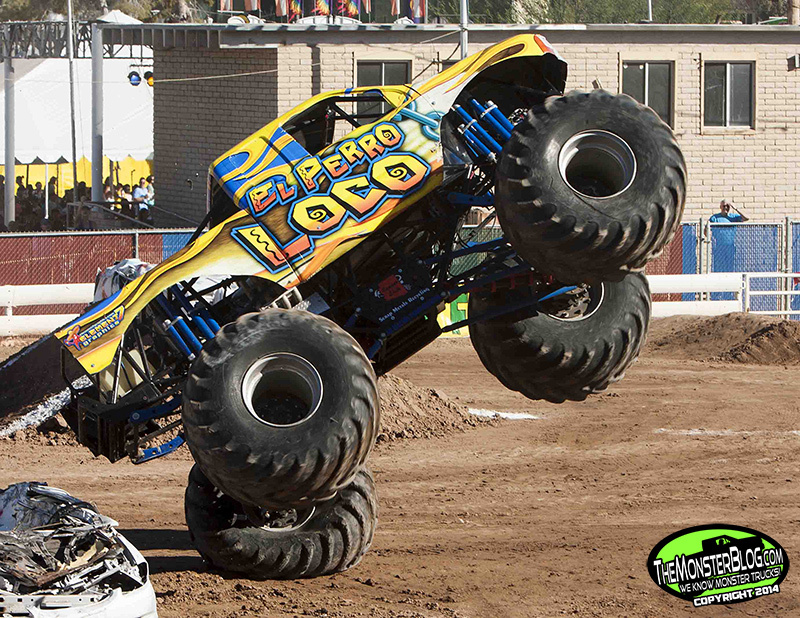 When all the points were tallied up, Rod Wood and El Perro Loco were declared the Arizona State Fair Overall Champions. 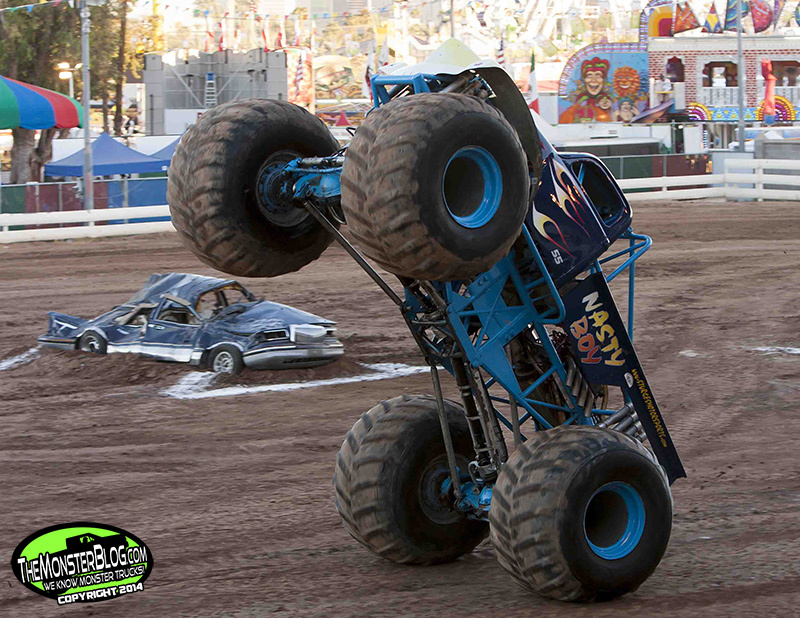 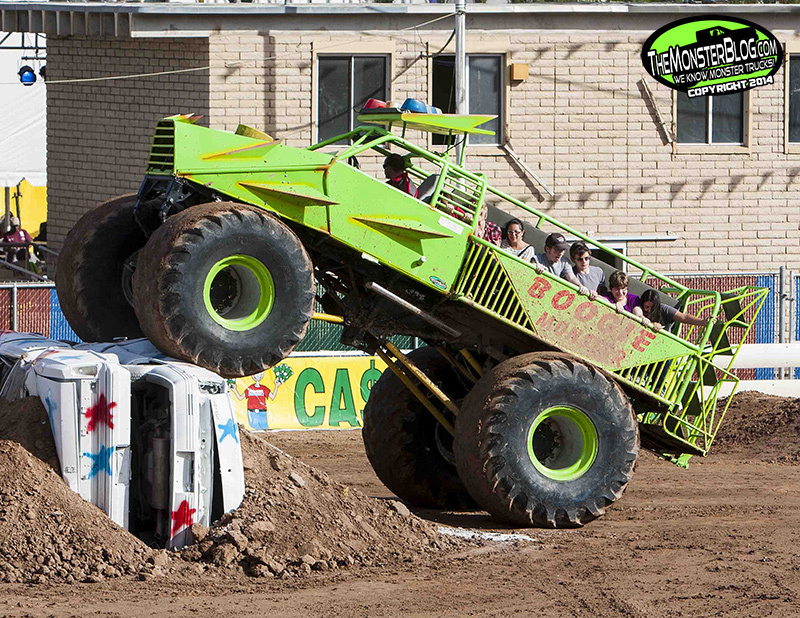 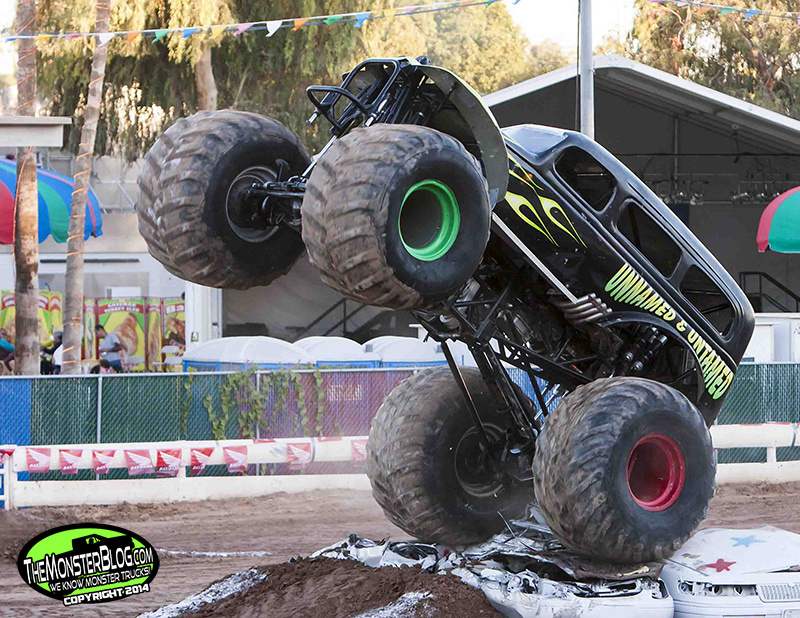 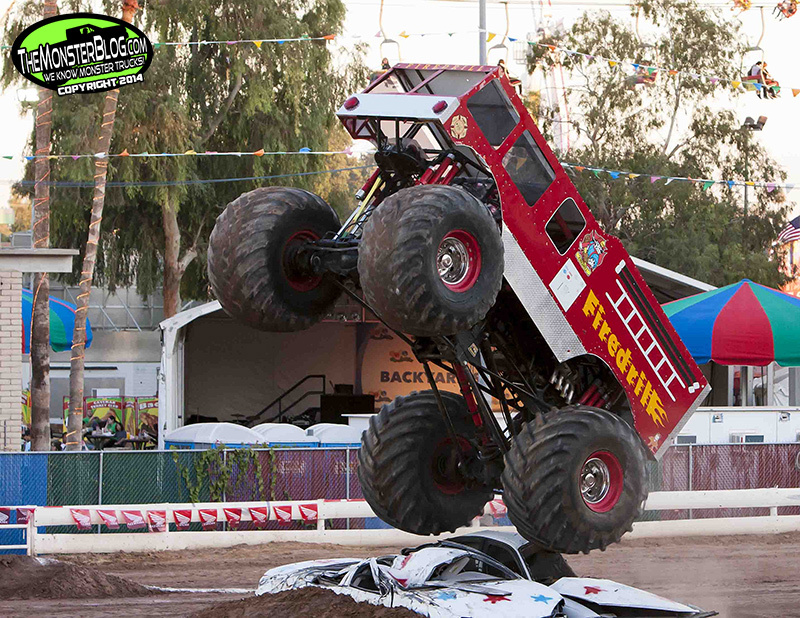 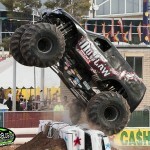 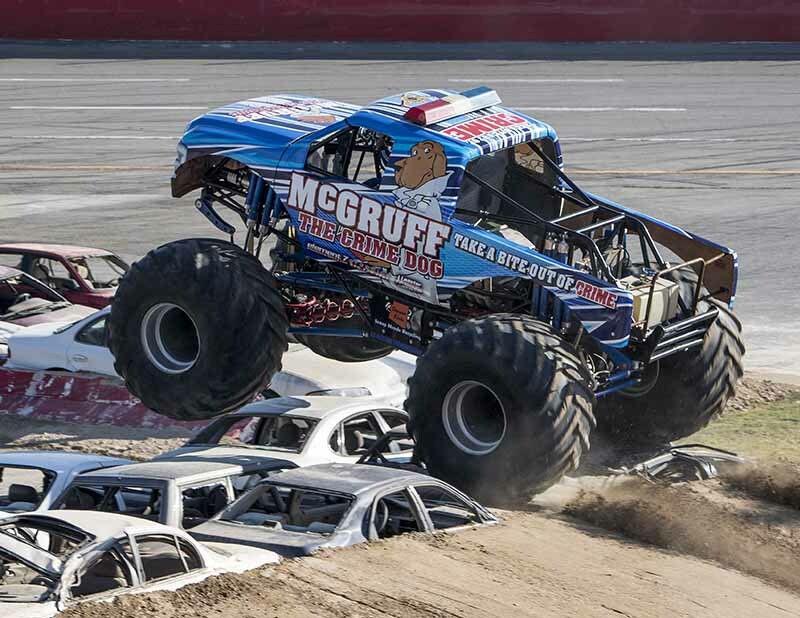 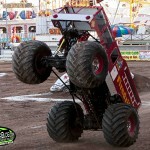 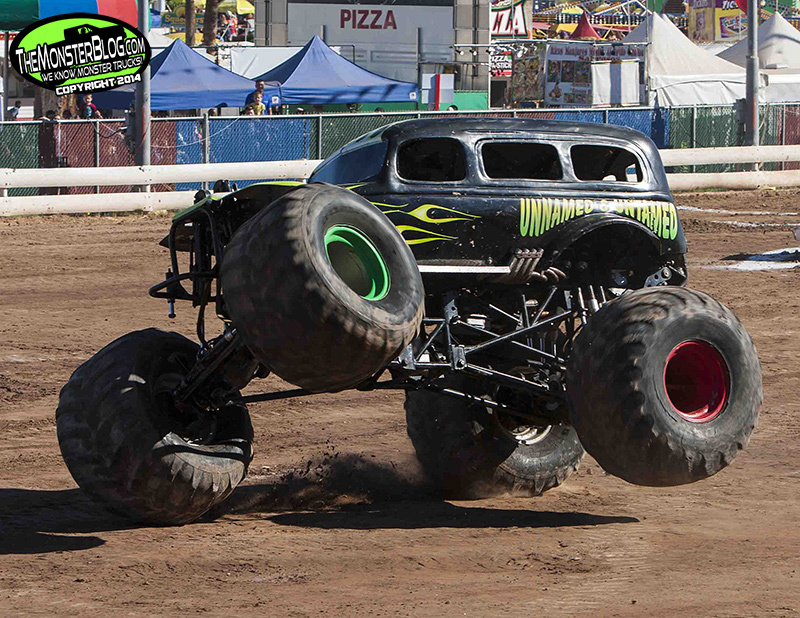 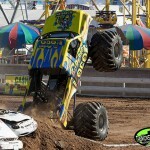 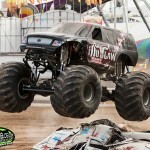 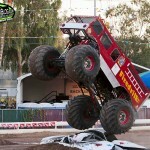 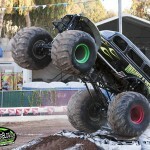 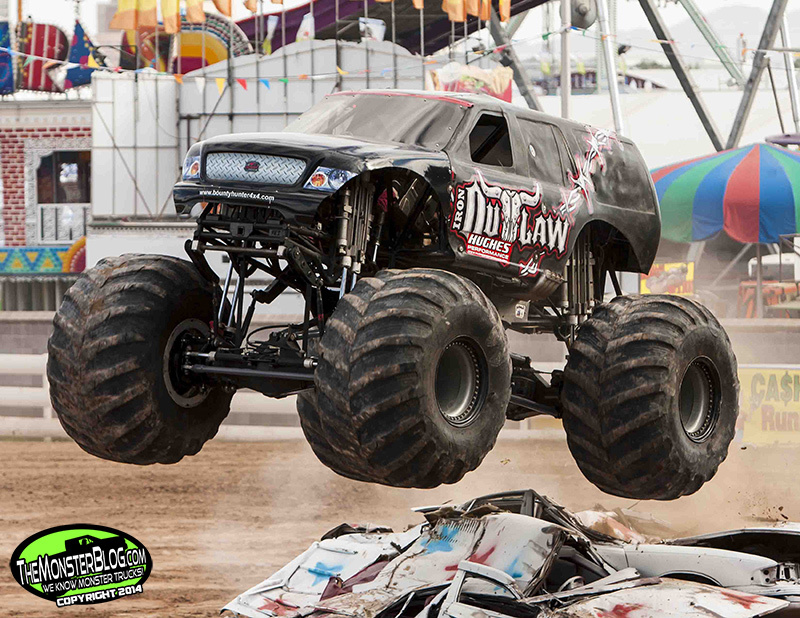 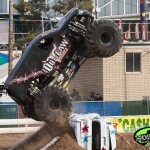 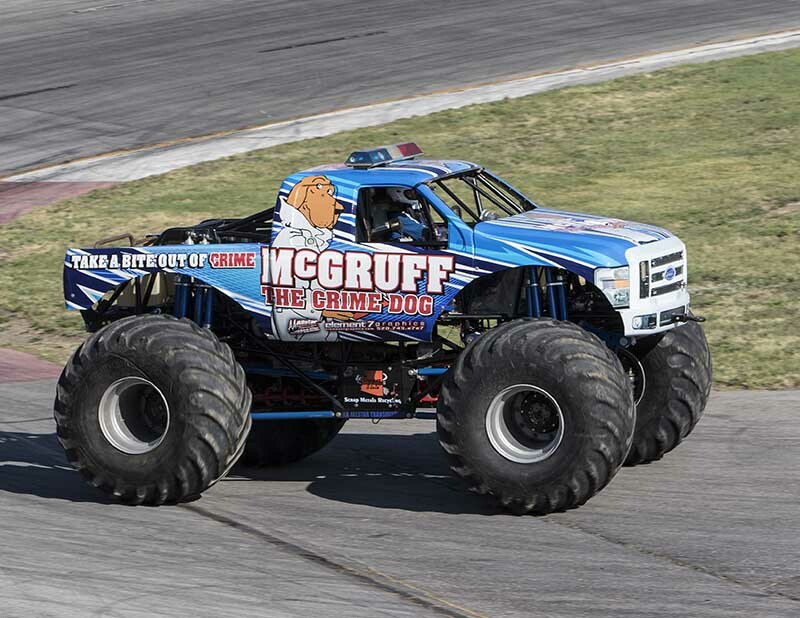 The weekend also featured some thrilling “tuff truck” action and rides for all with the Boogie Monster. 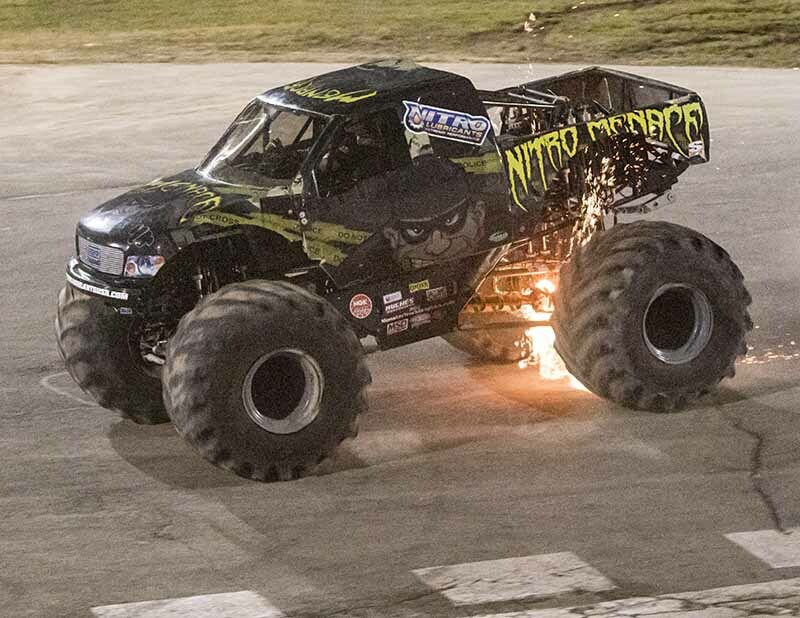 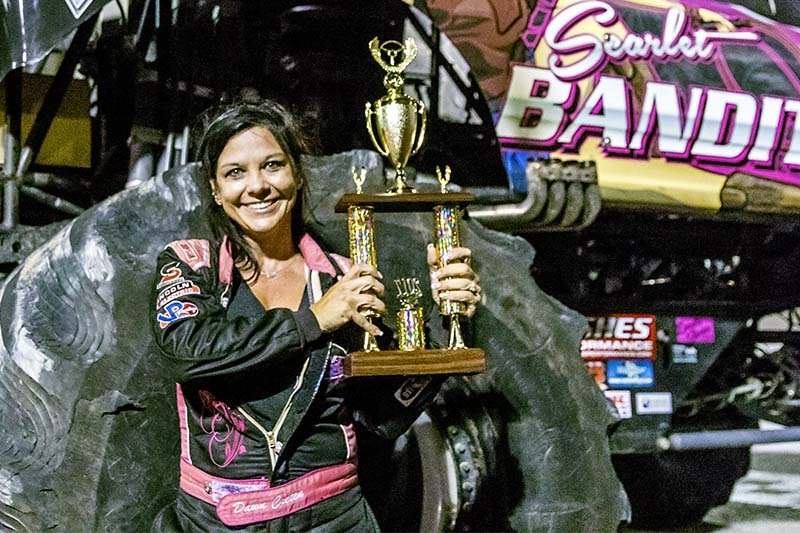 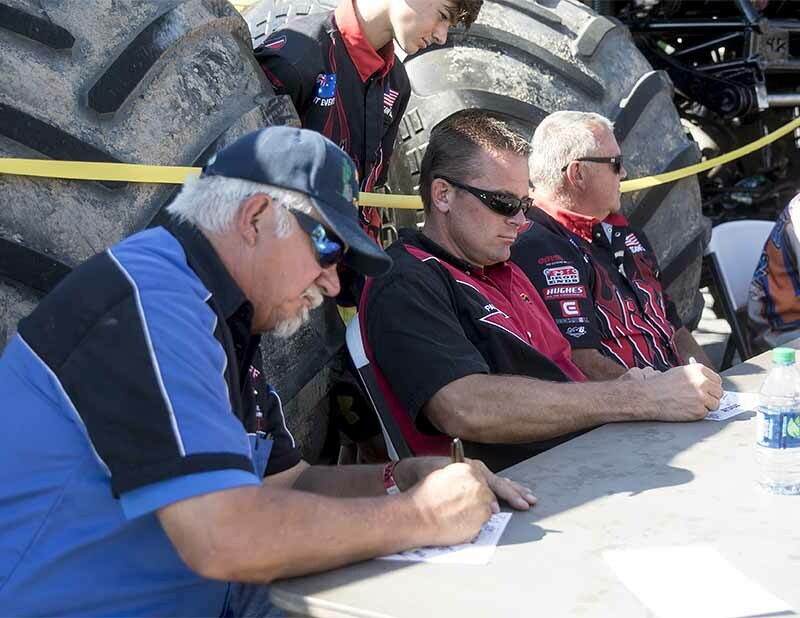 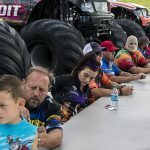 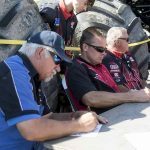 For us at “the Allen Report”, next up caught a plane to northern Indiana to watch five legends of the monster truck sport receive induction into the International Monster Truck Hall of Fame. 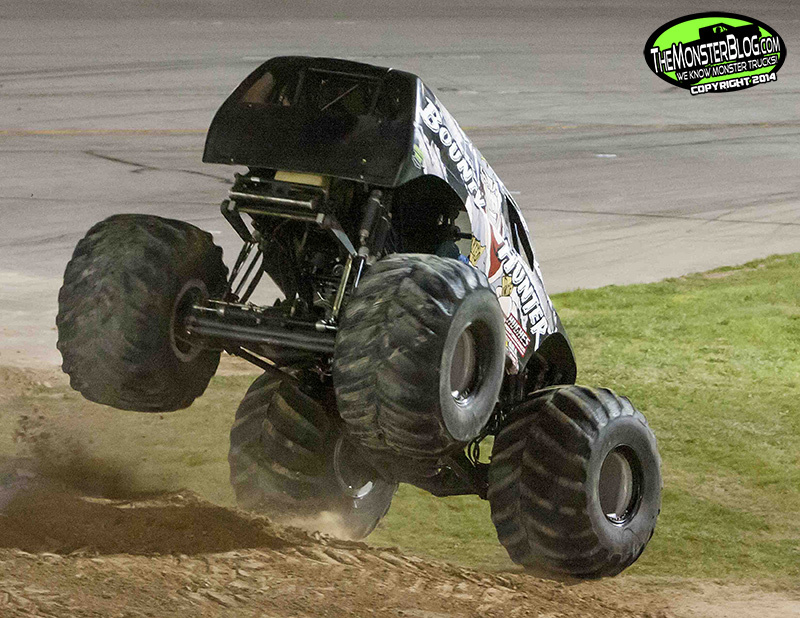 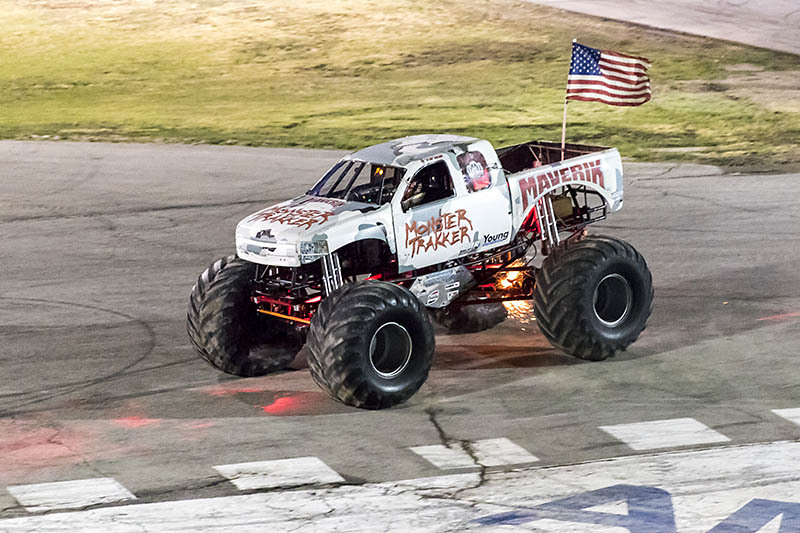 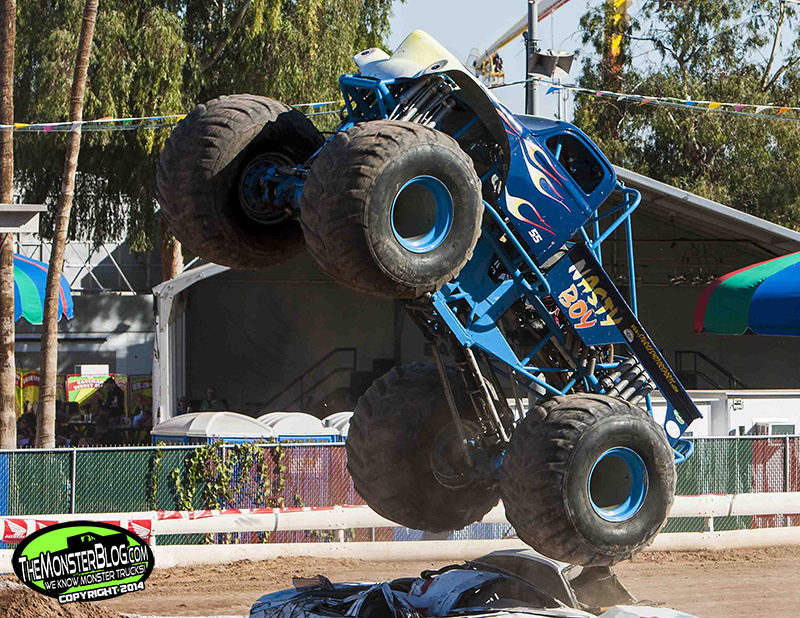 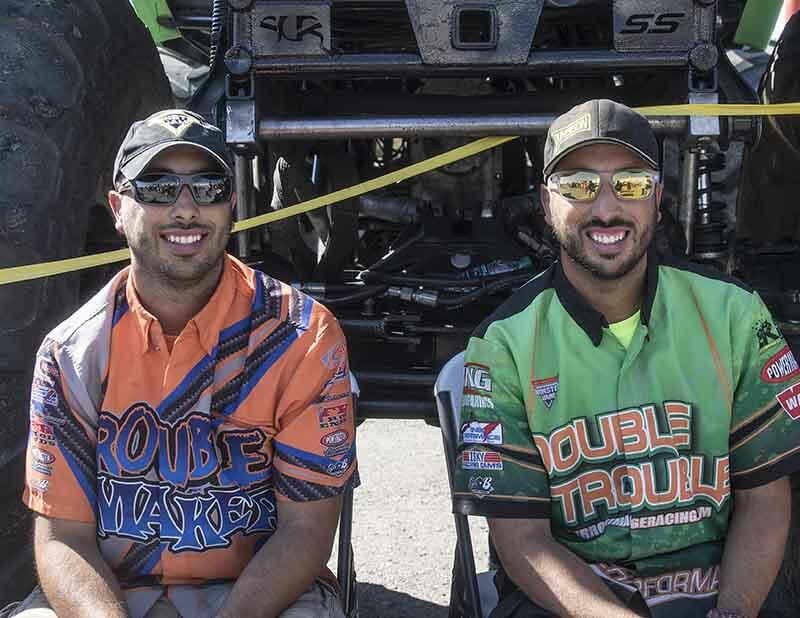 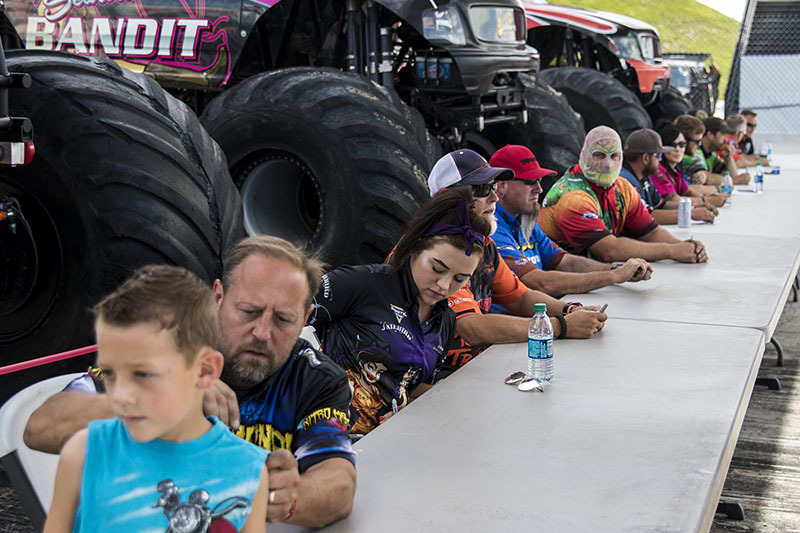 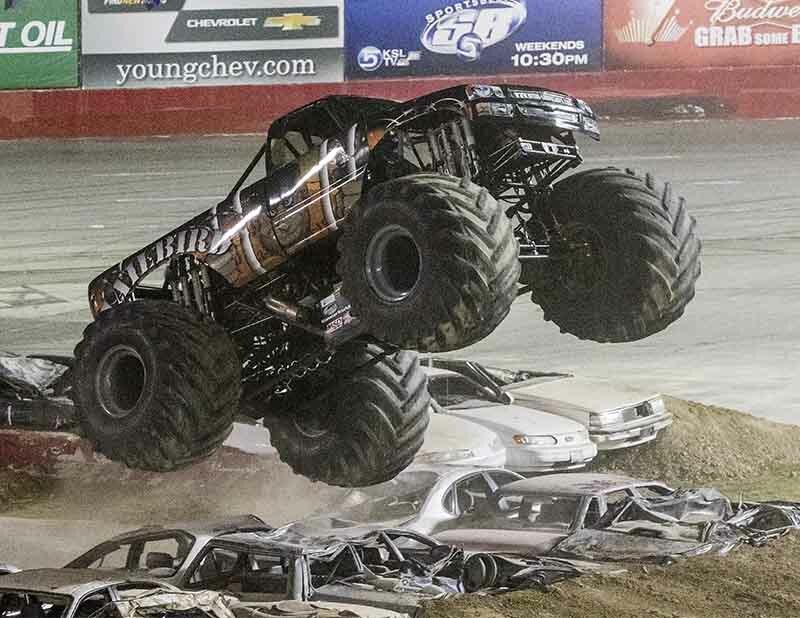 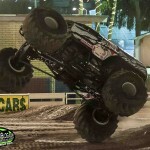 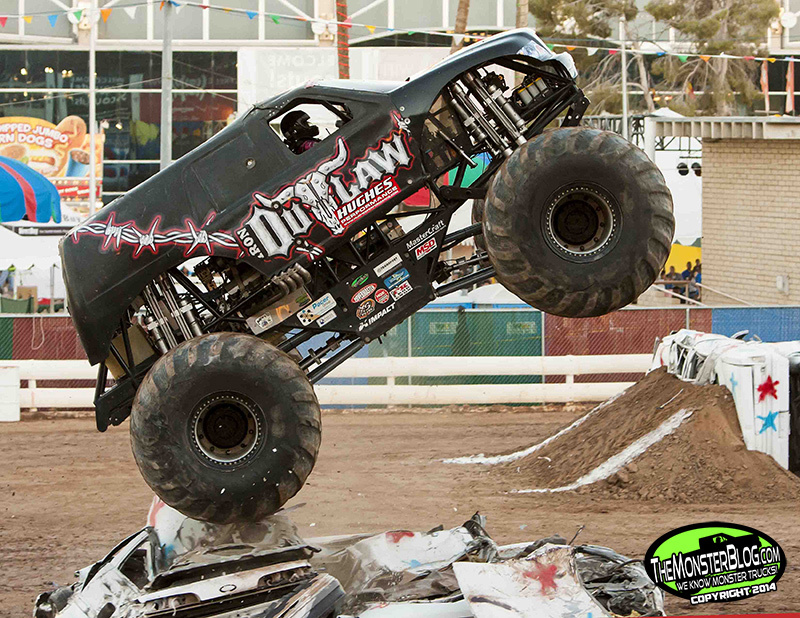 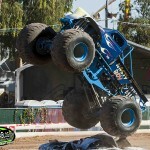 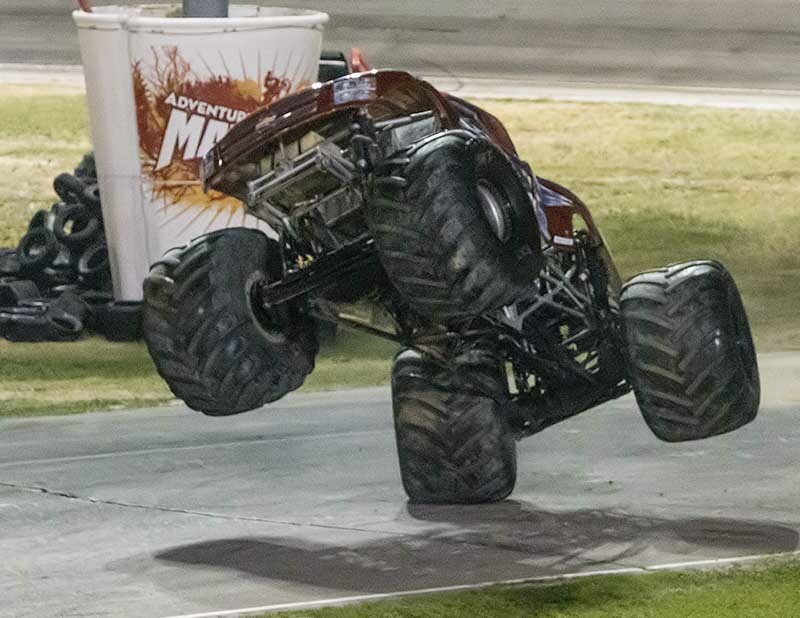 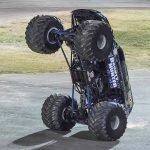 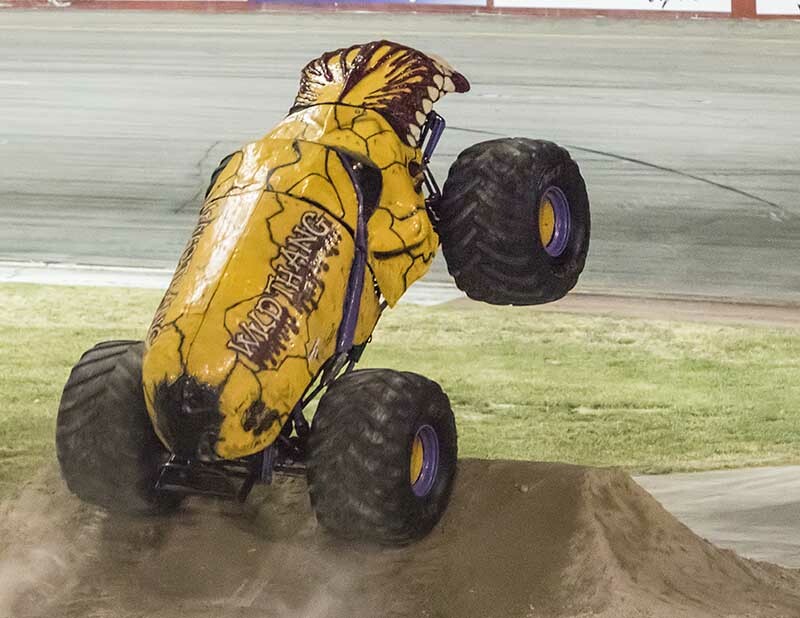 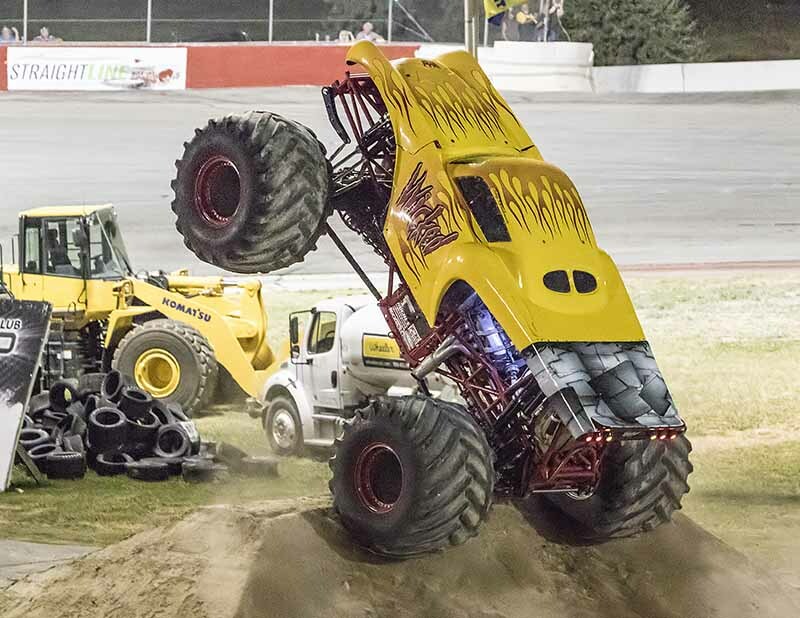 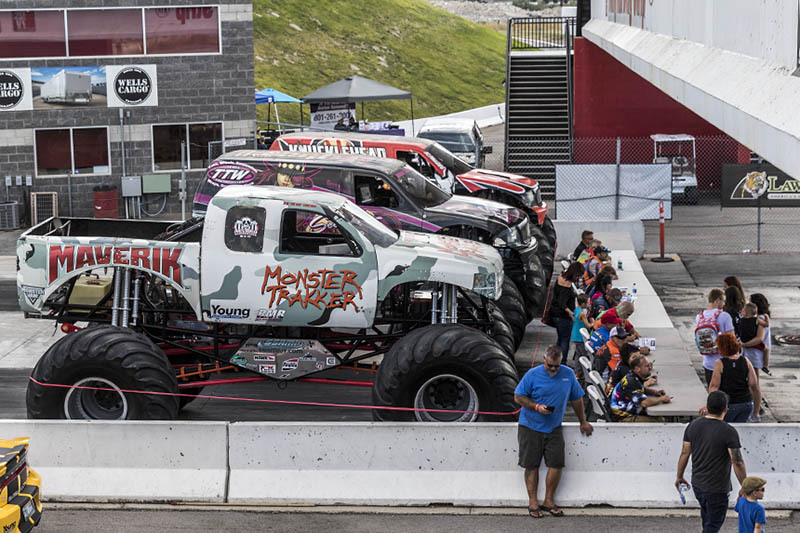 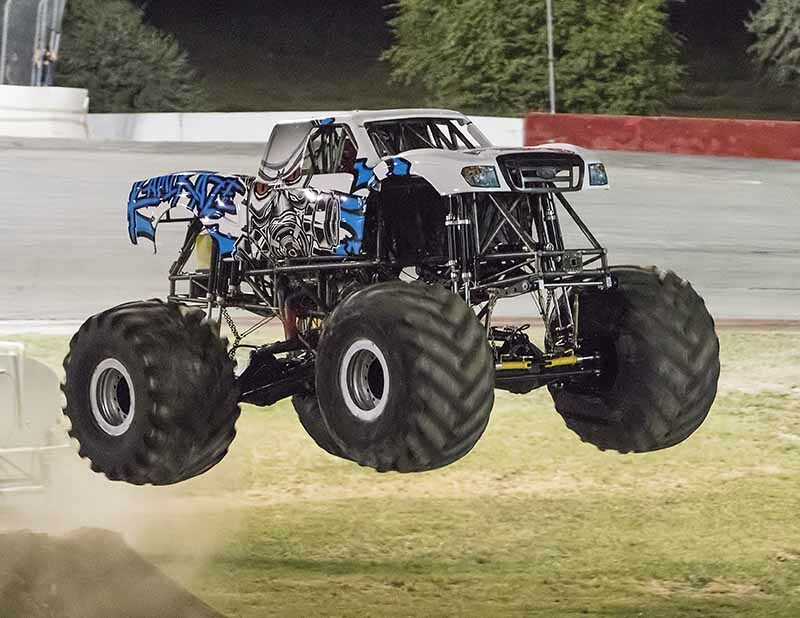 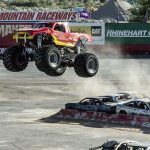 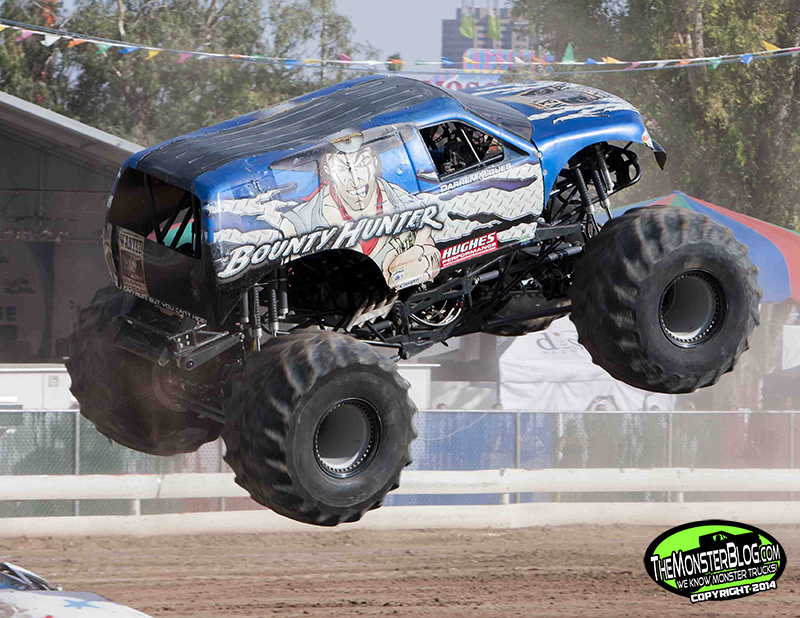 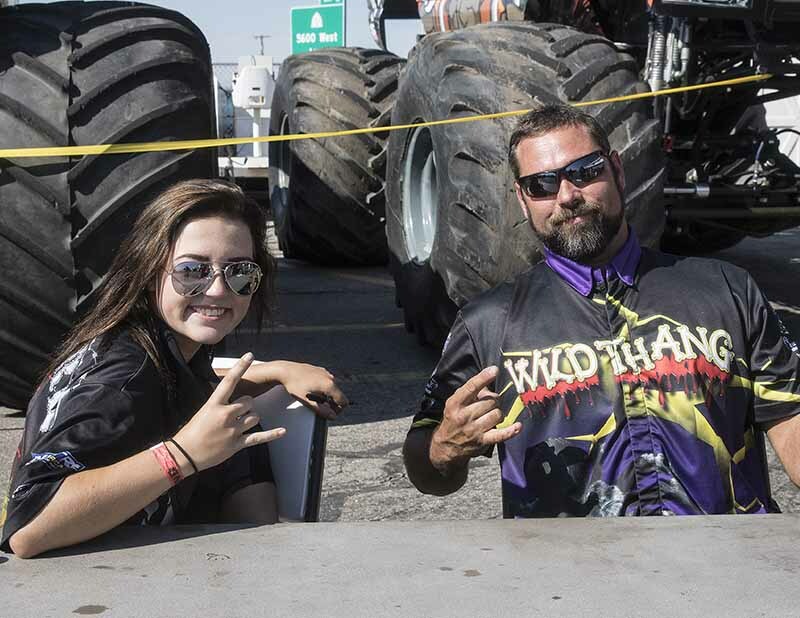 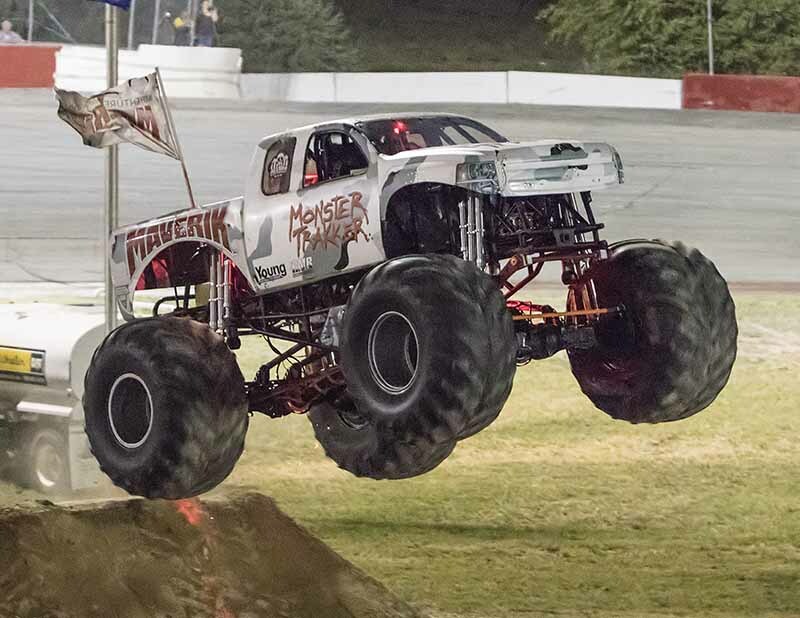 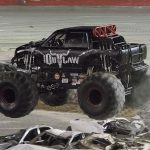 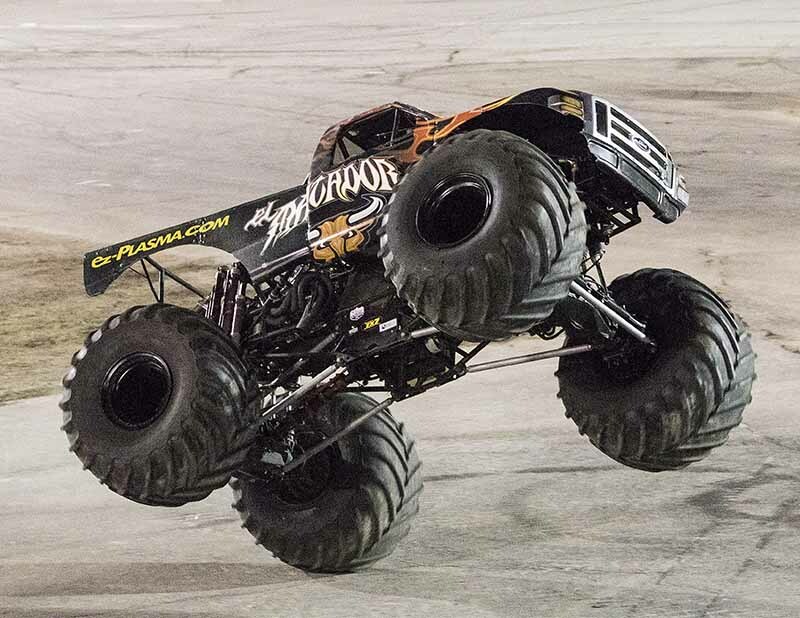 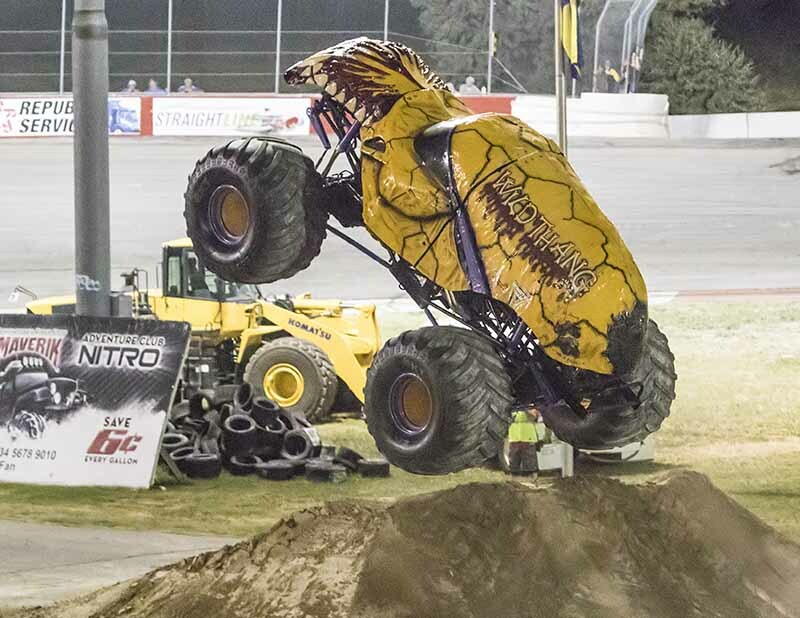 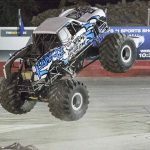 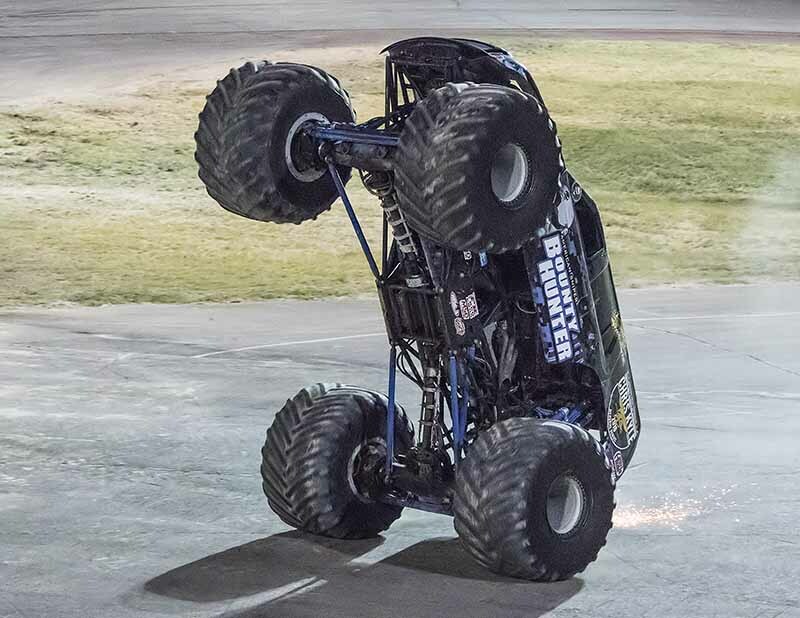 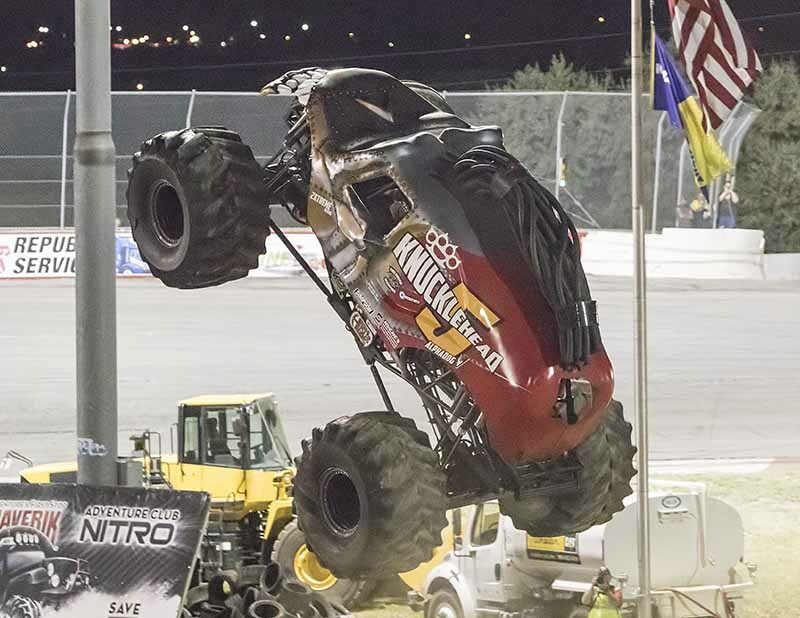 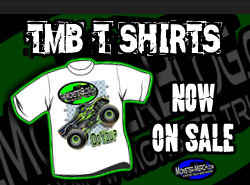 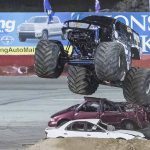 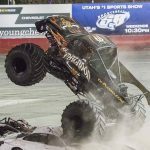 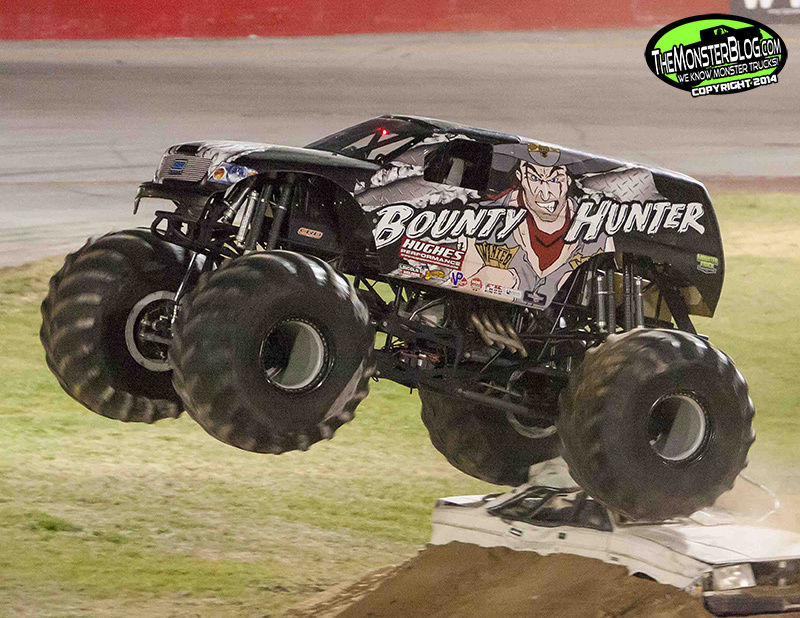 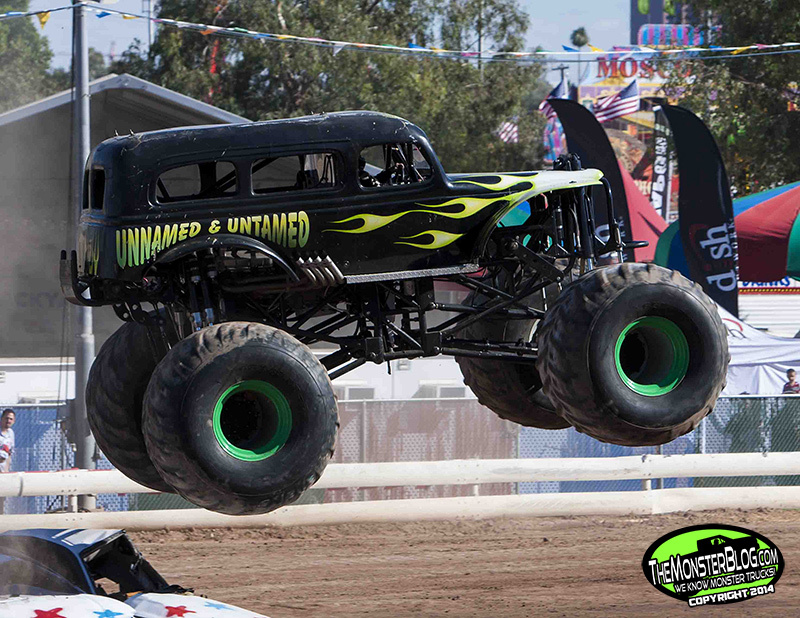 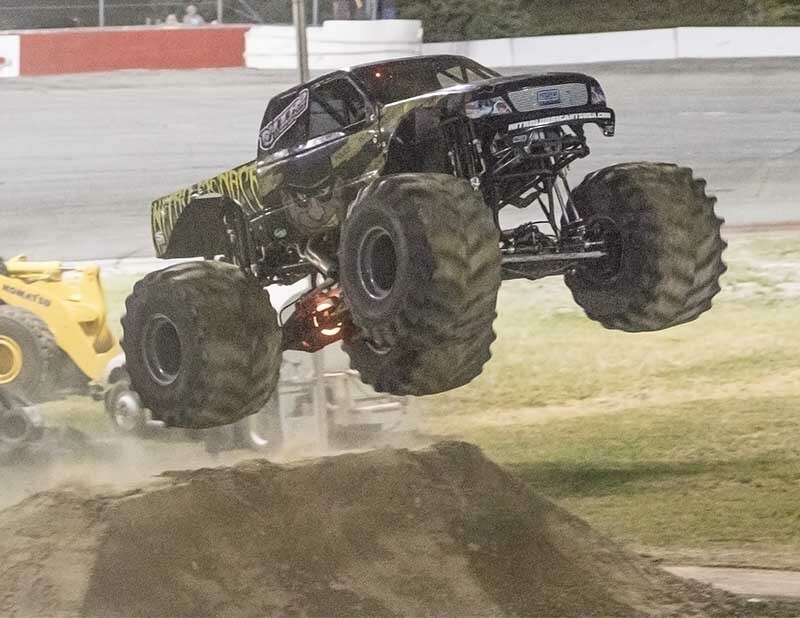 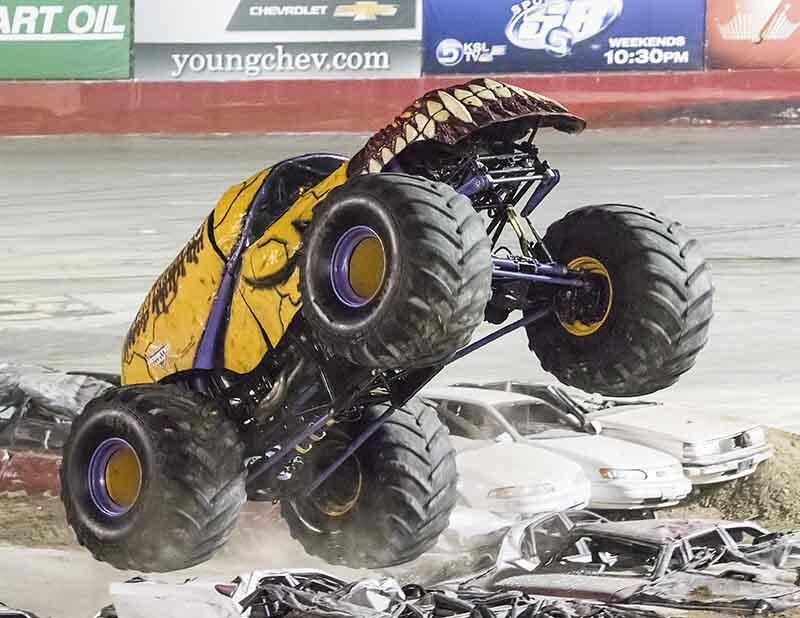 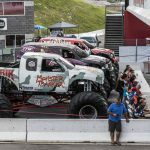 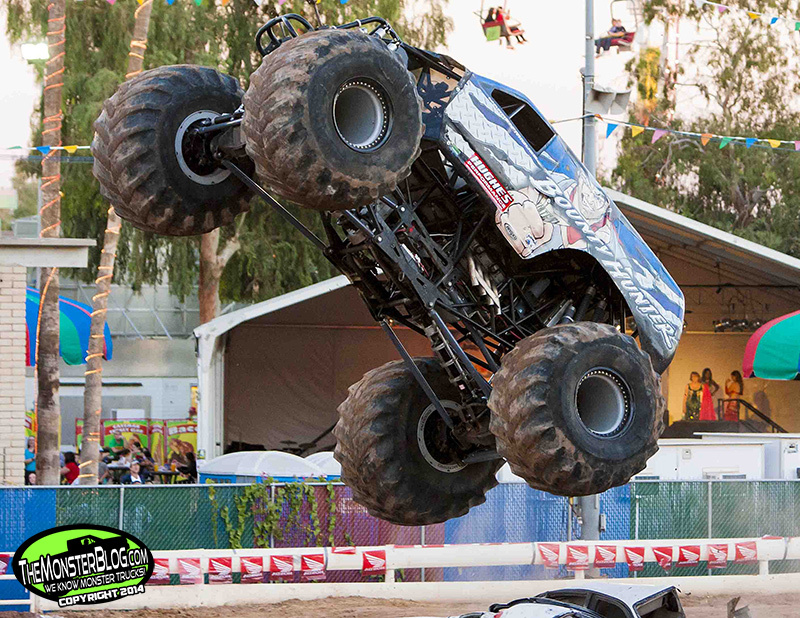 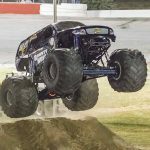 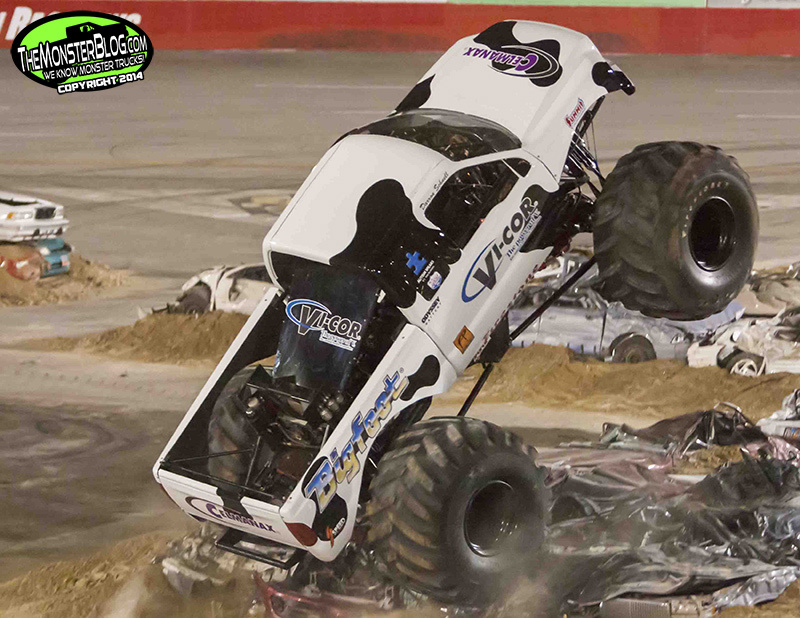 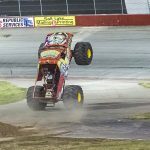 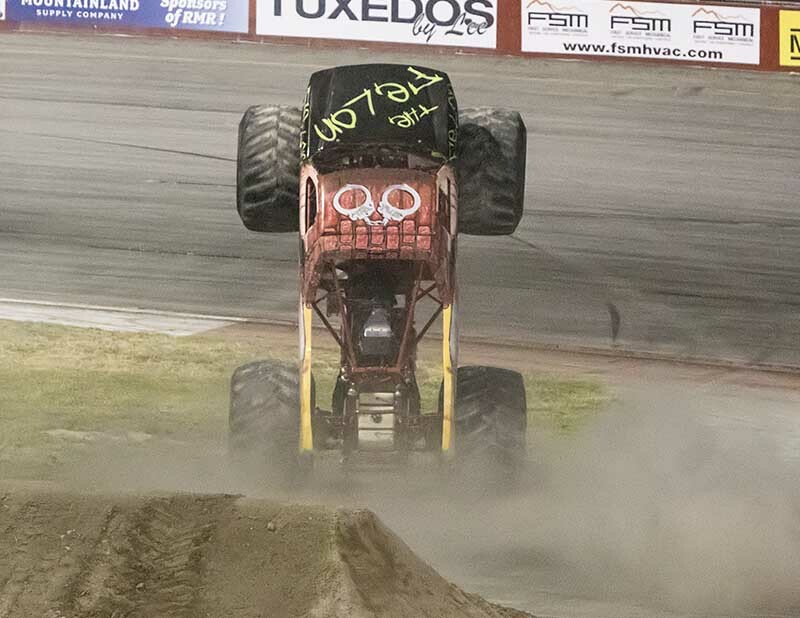 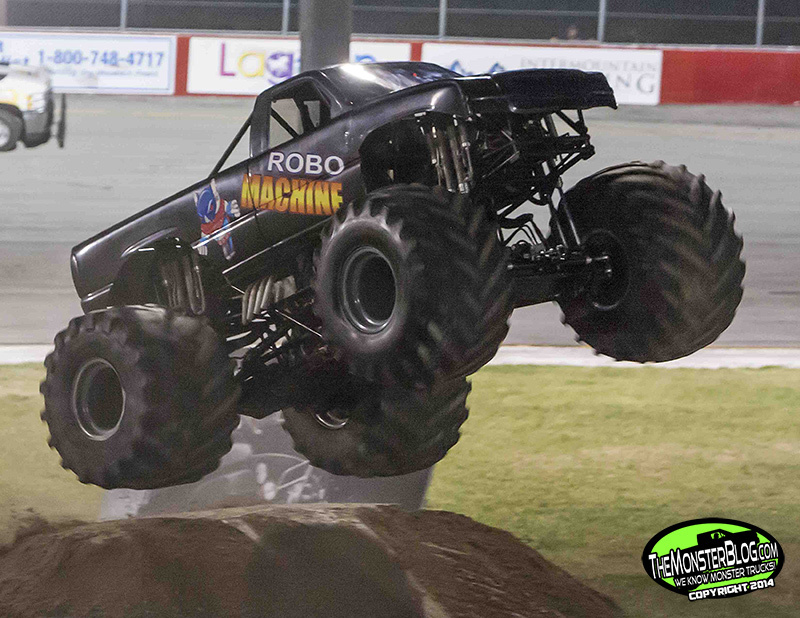 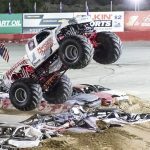 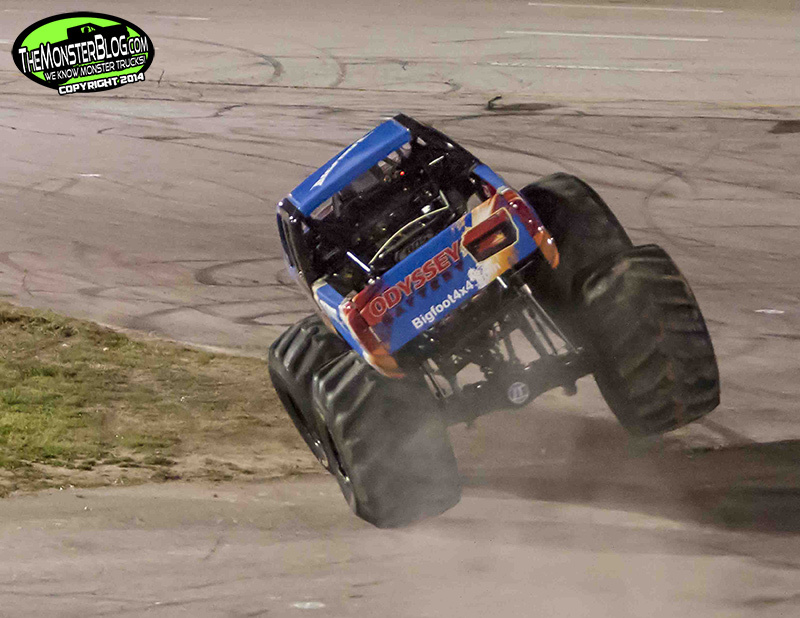 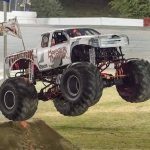 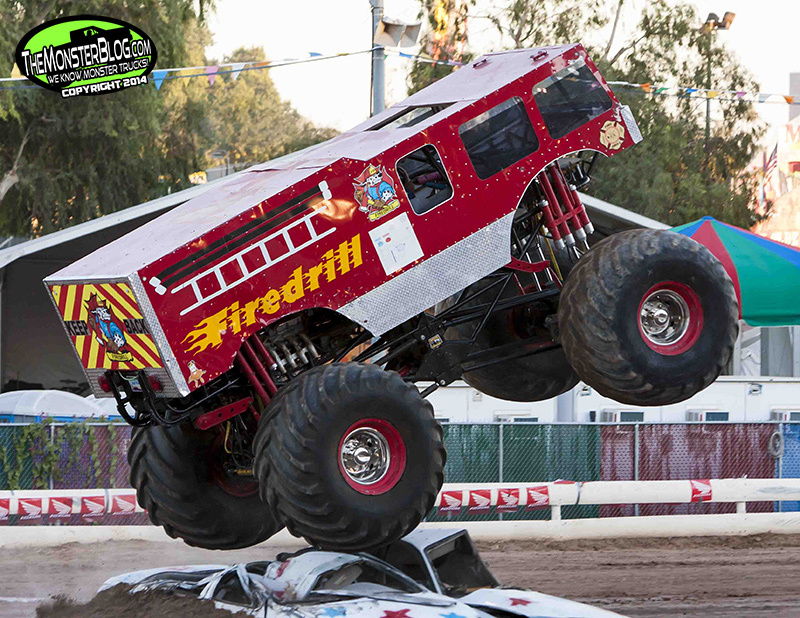 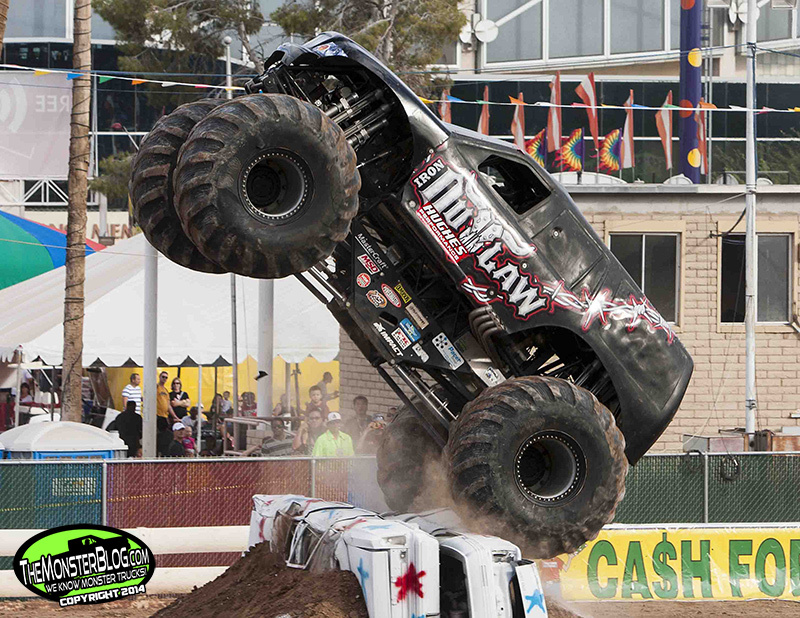 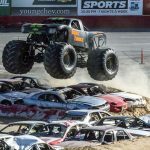 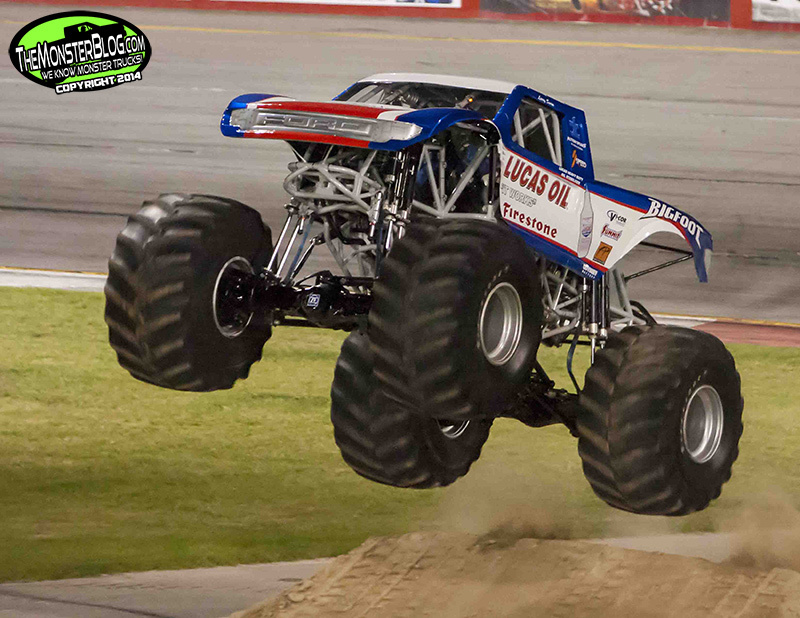 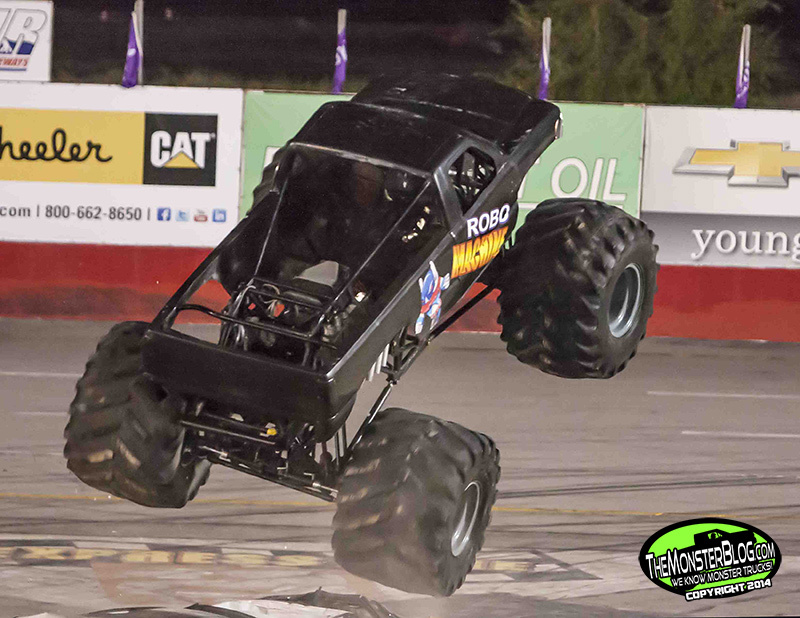 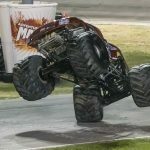 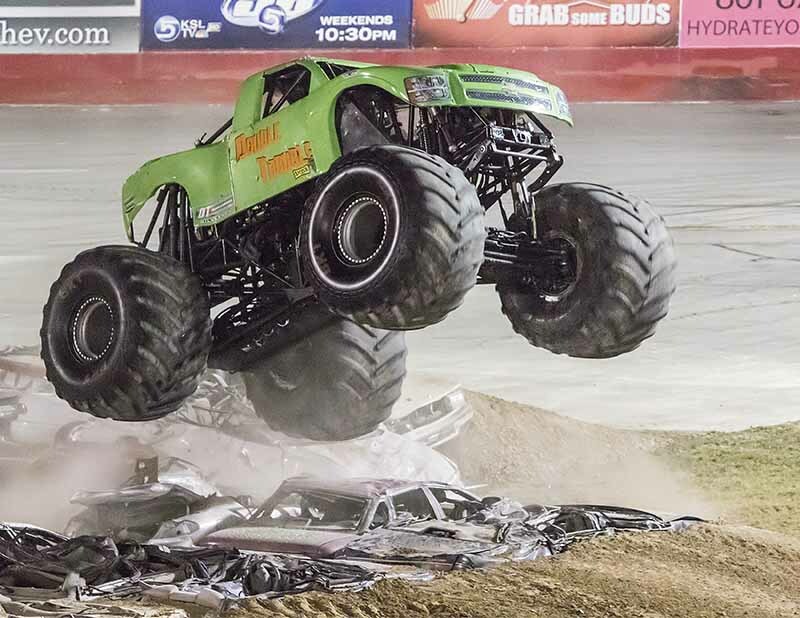 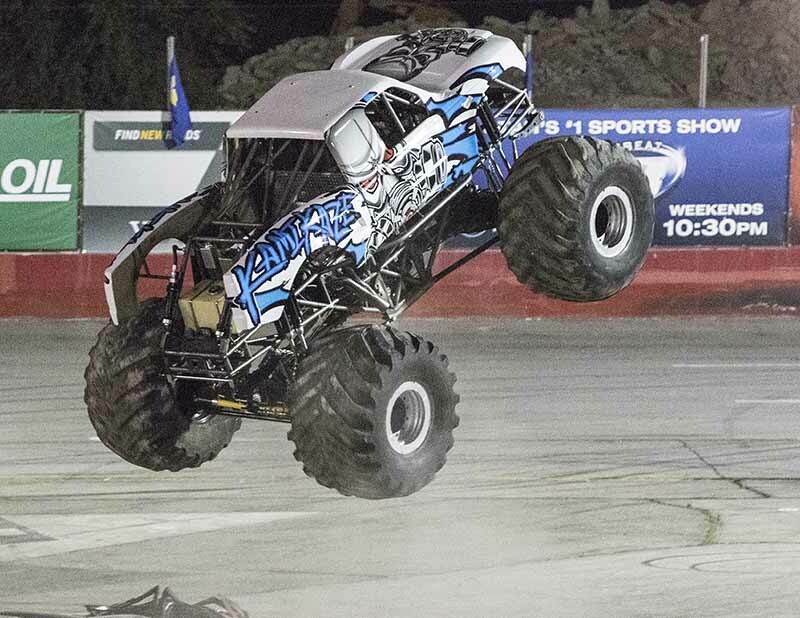 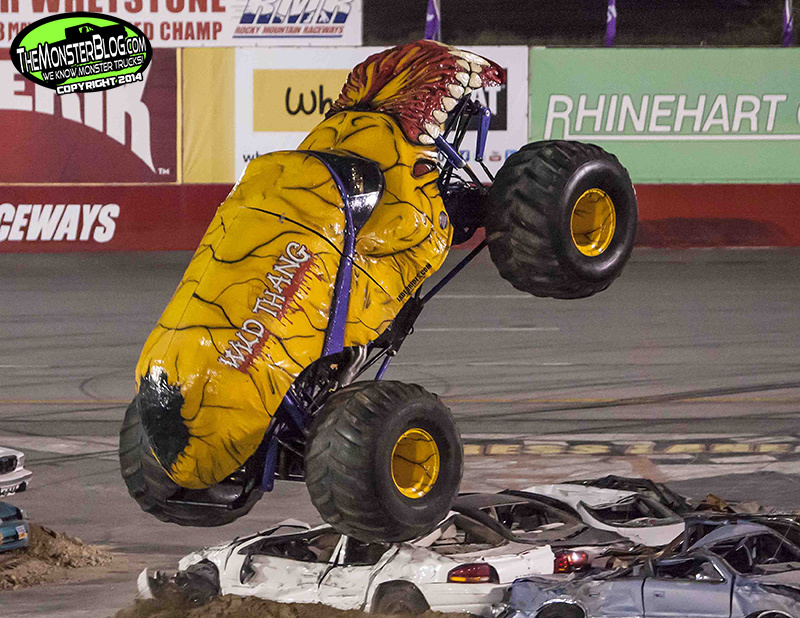 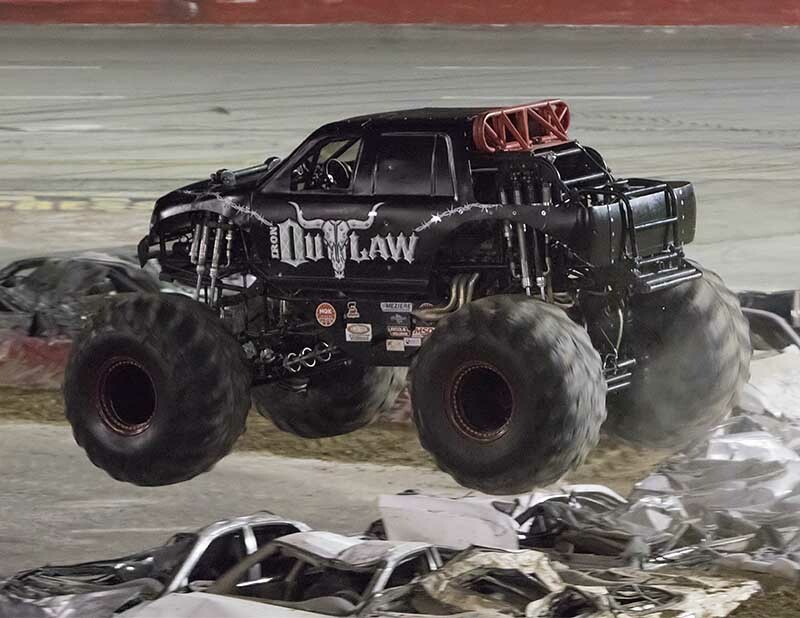 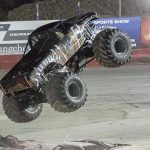 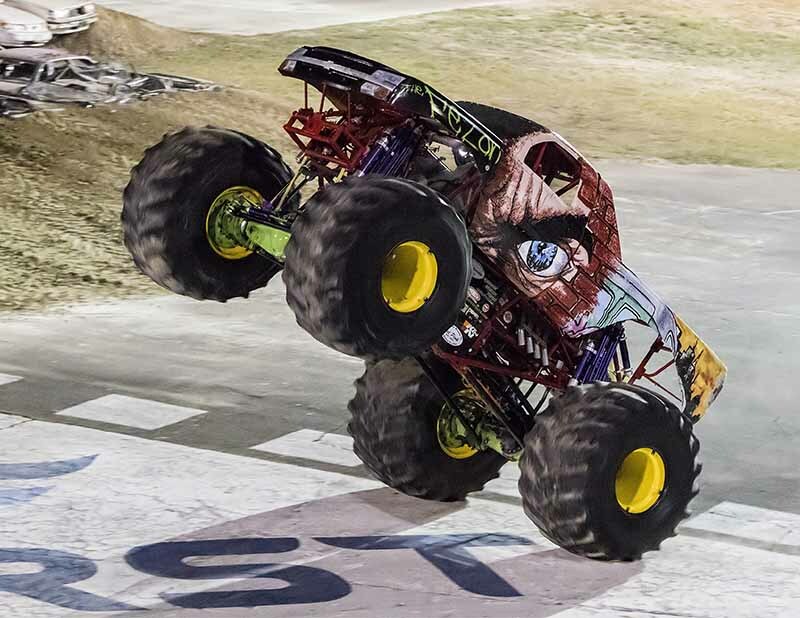 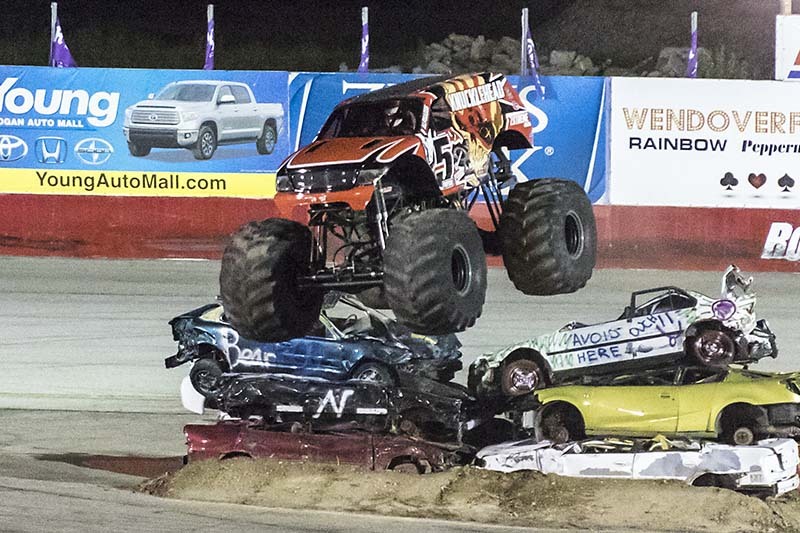 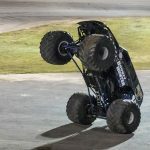 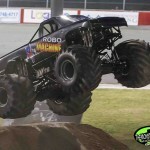 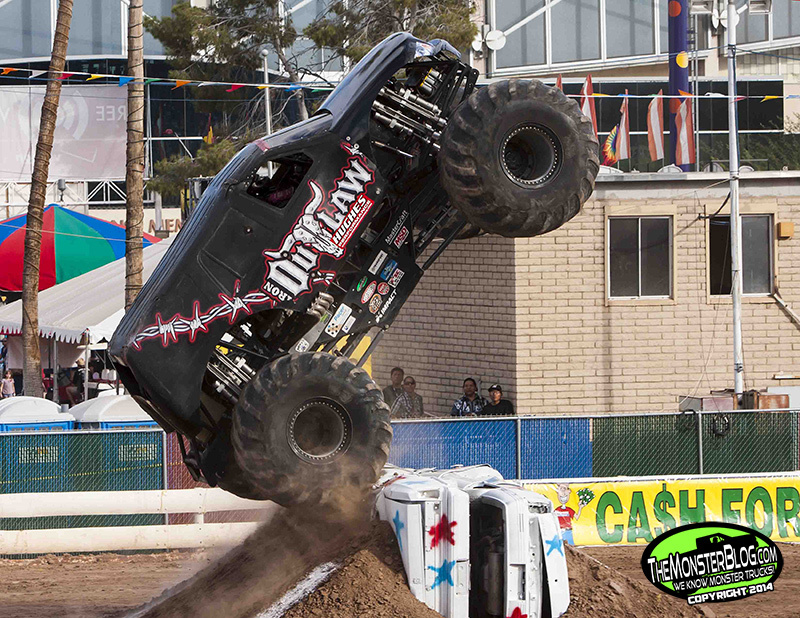 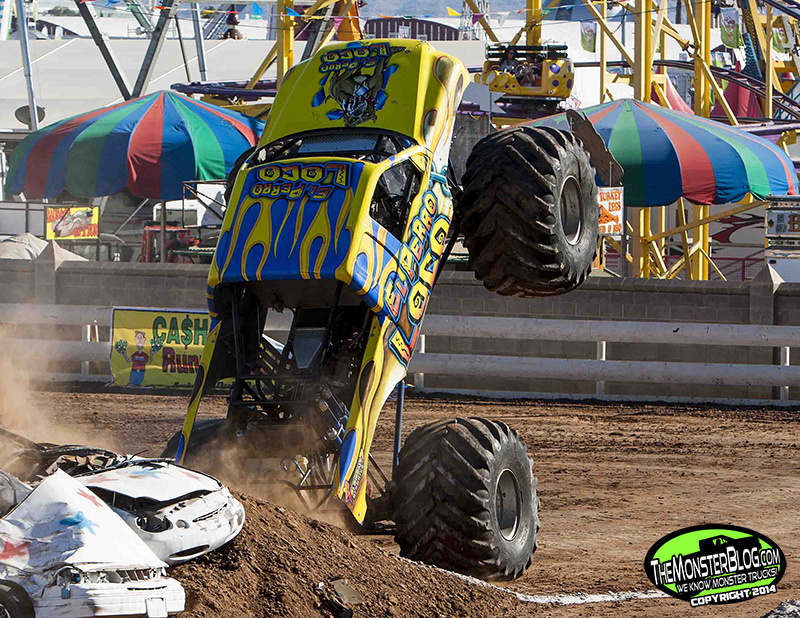 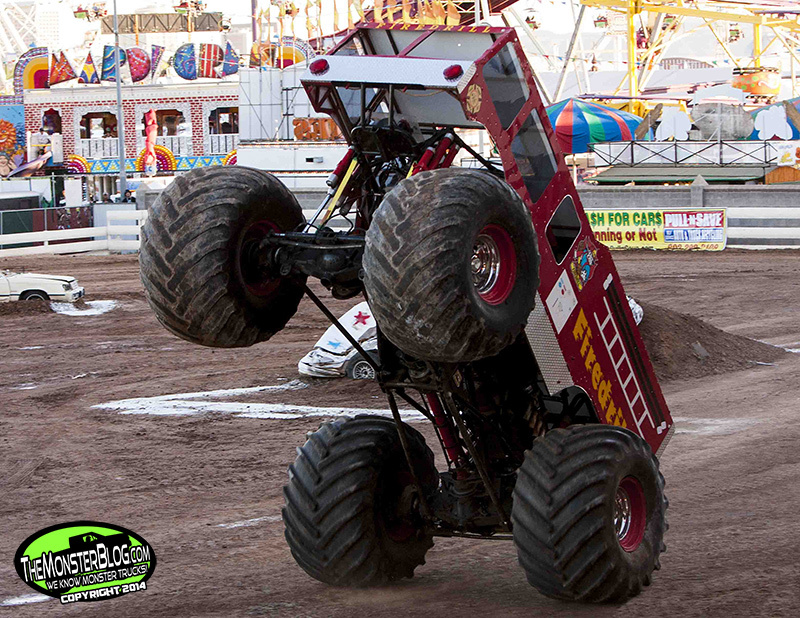 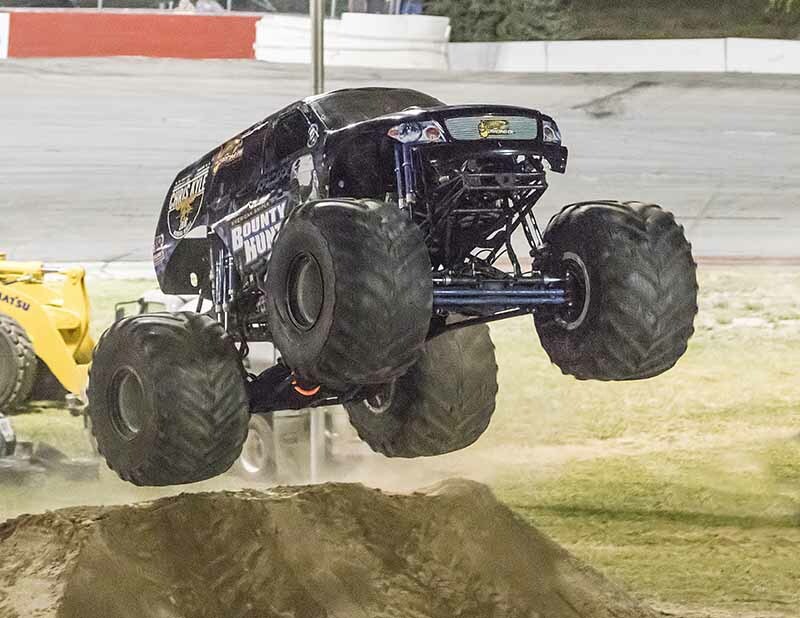 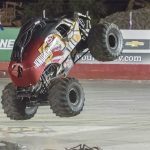 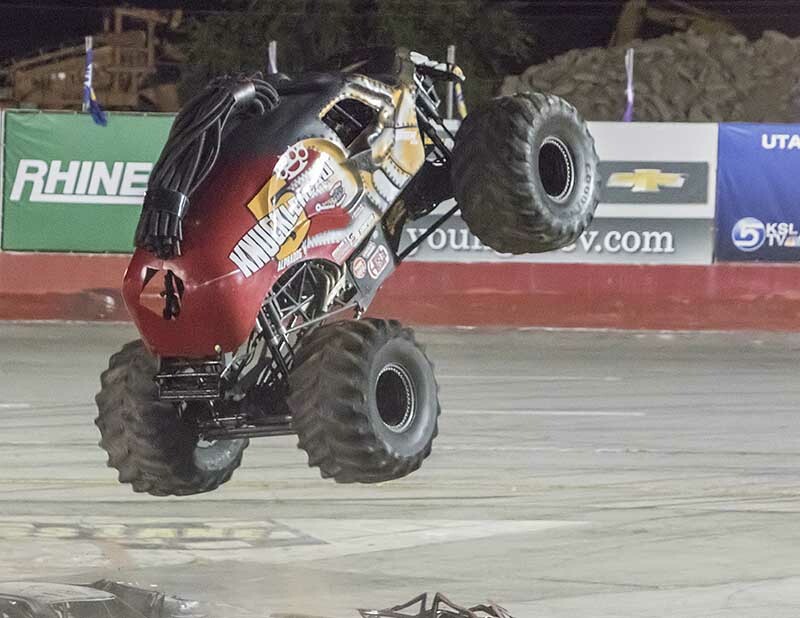 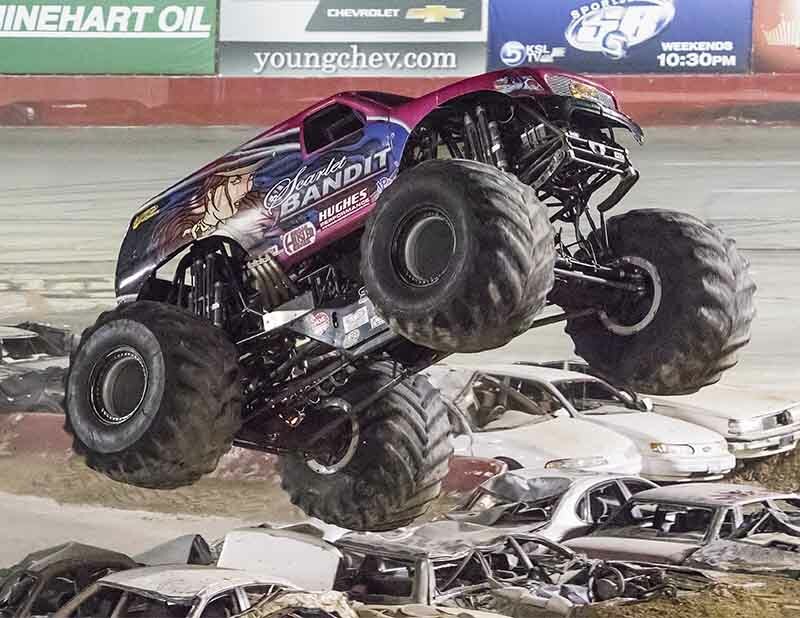 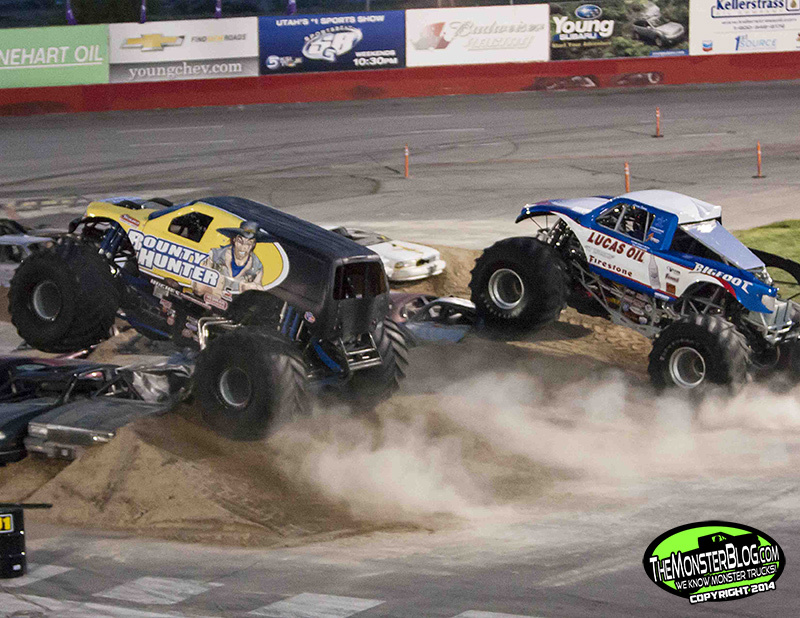 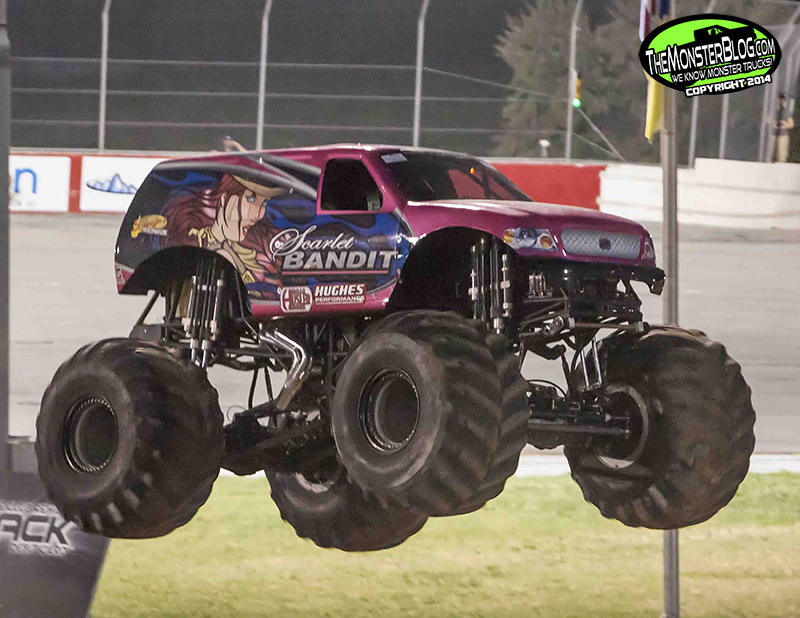 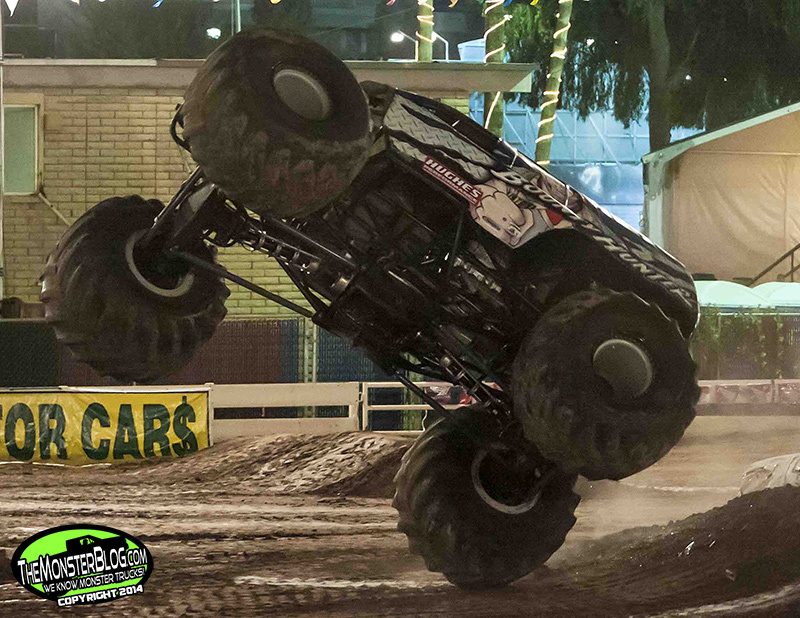 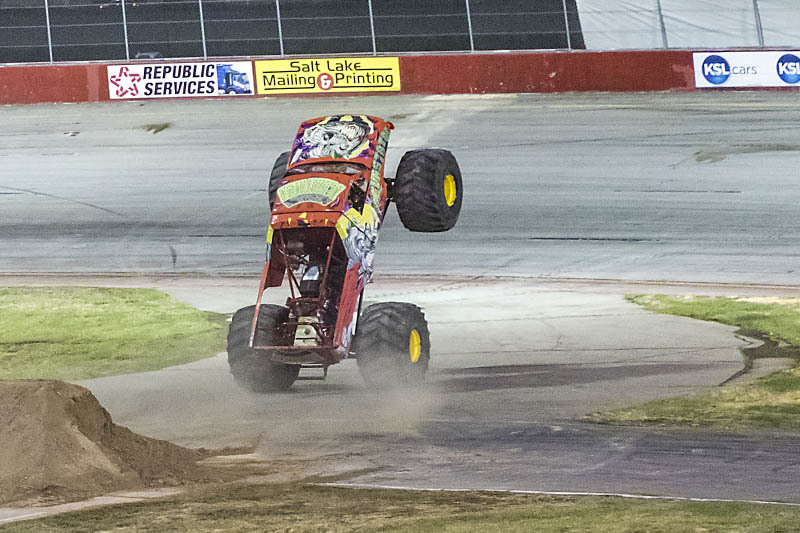 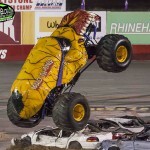 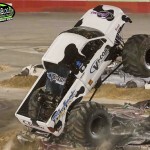 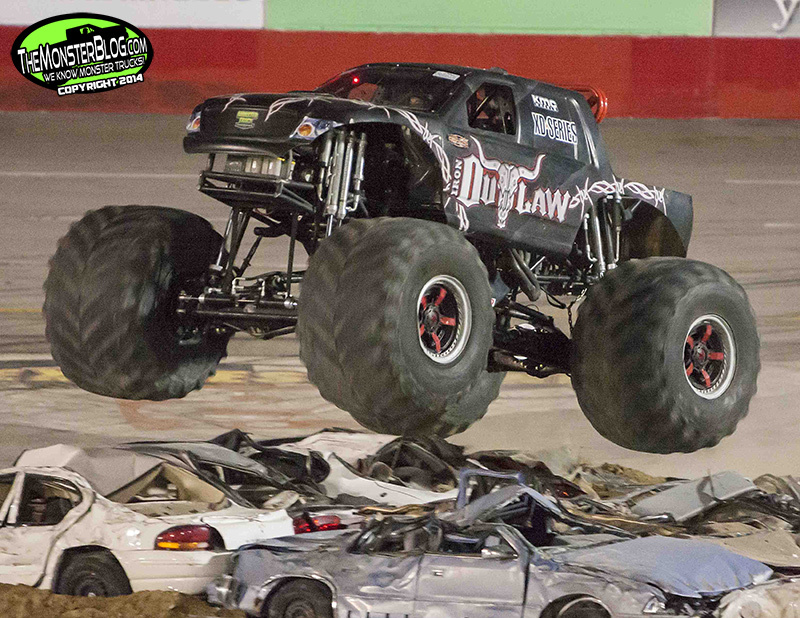 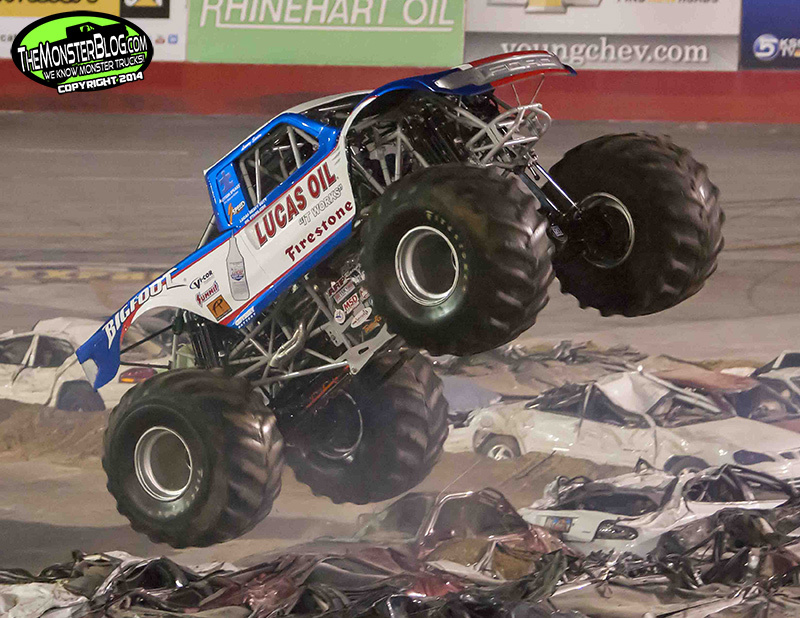 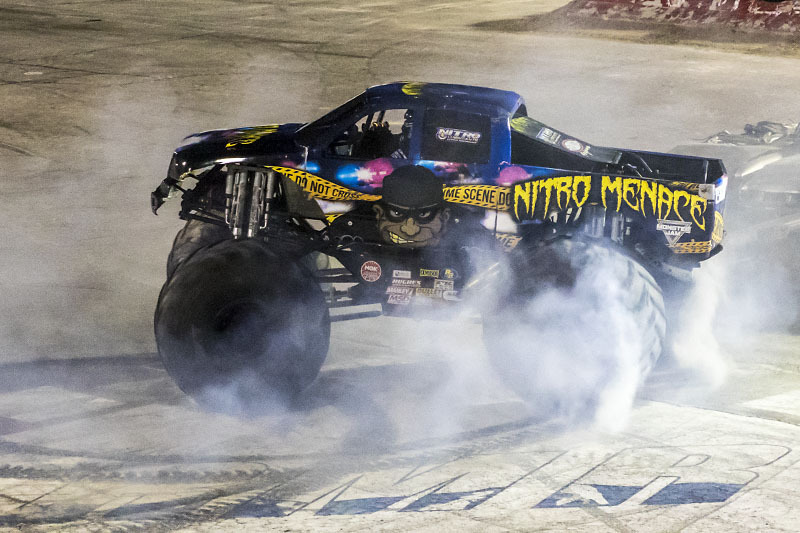 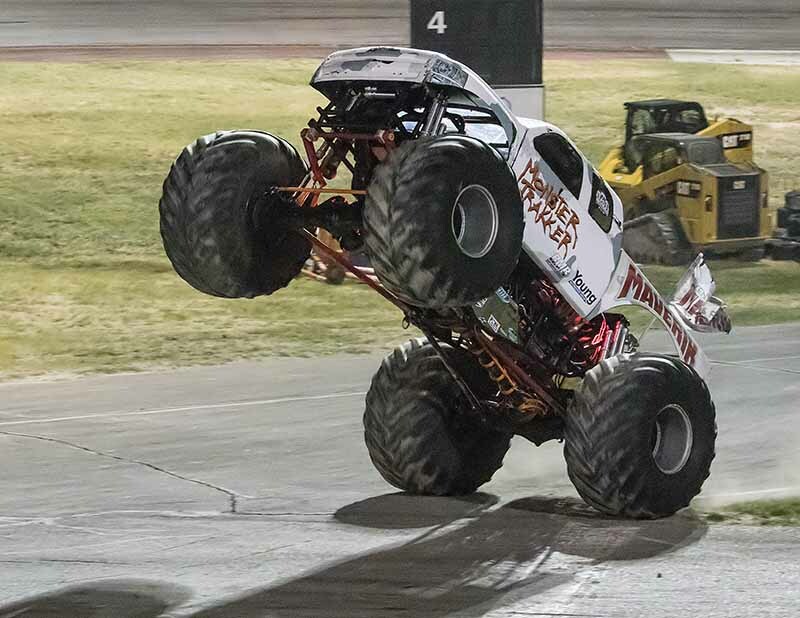 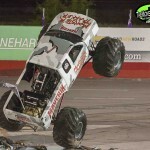 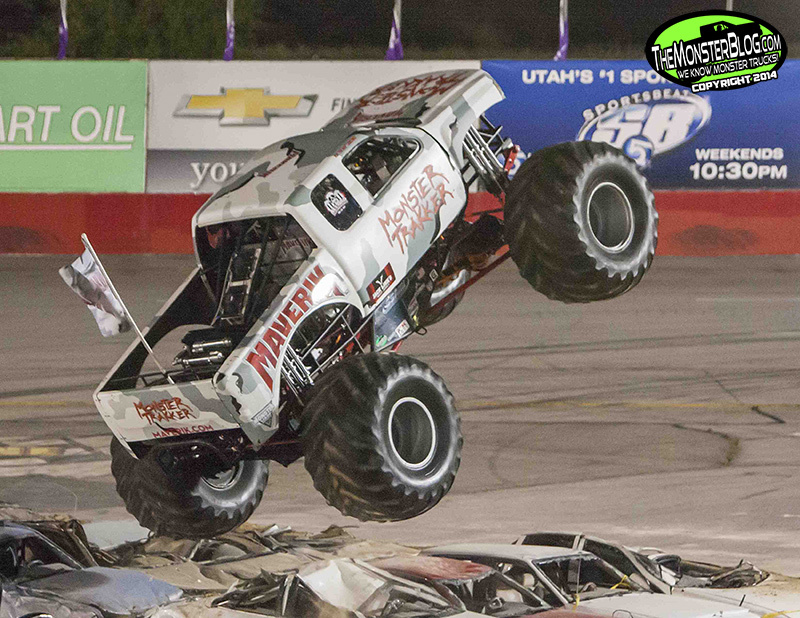 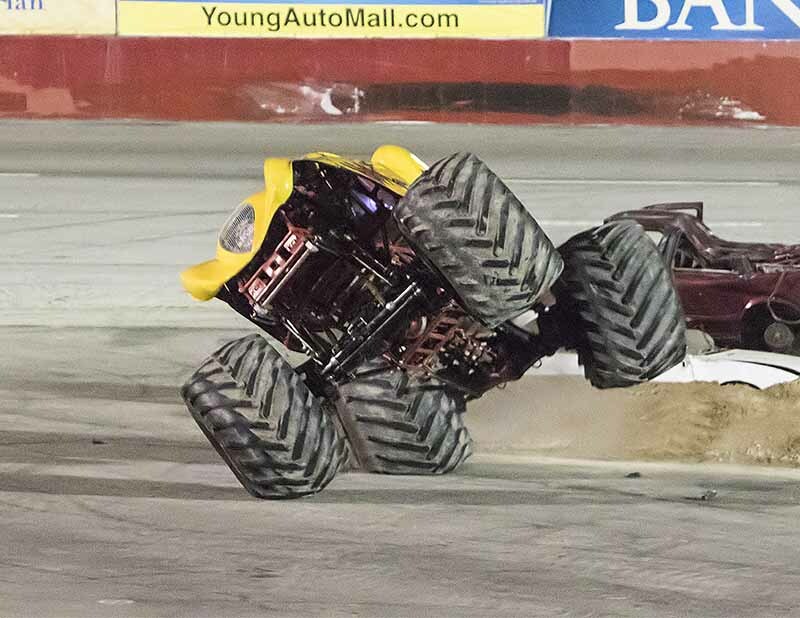 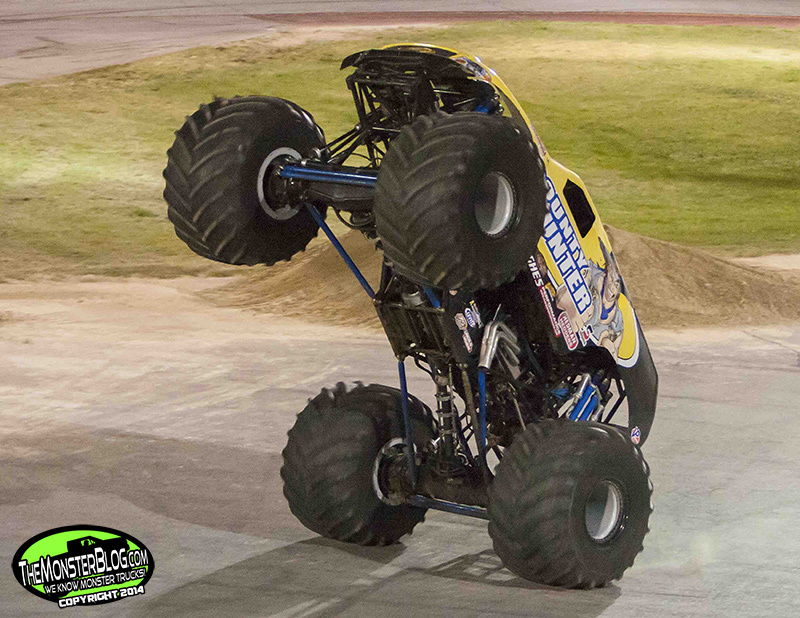 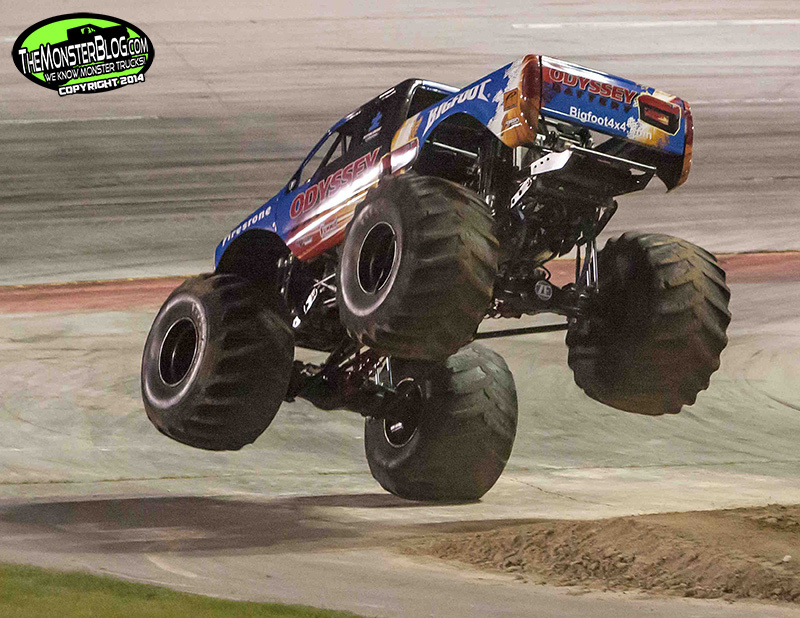 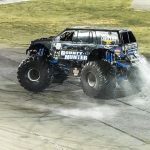 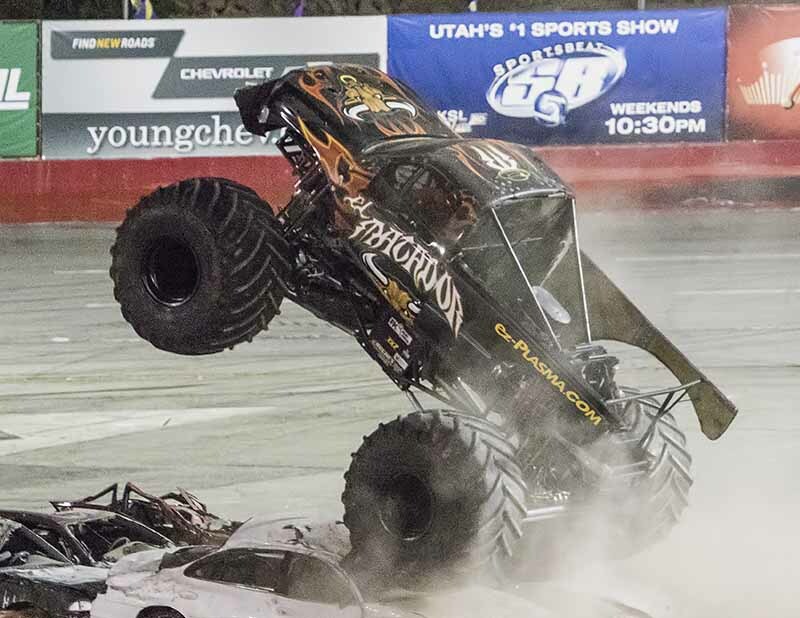 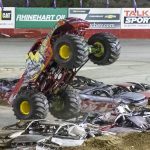 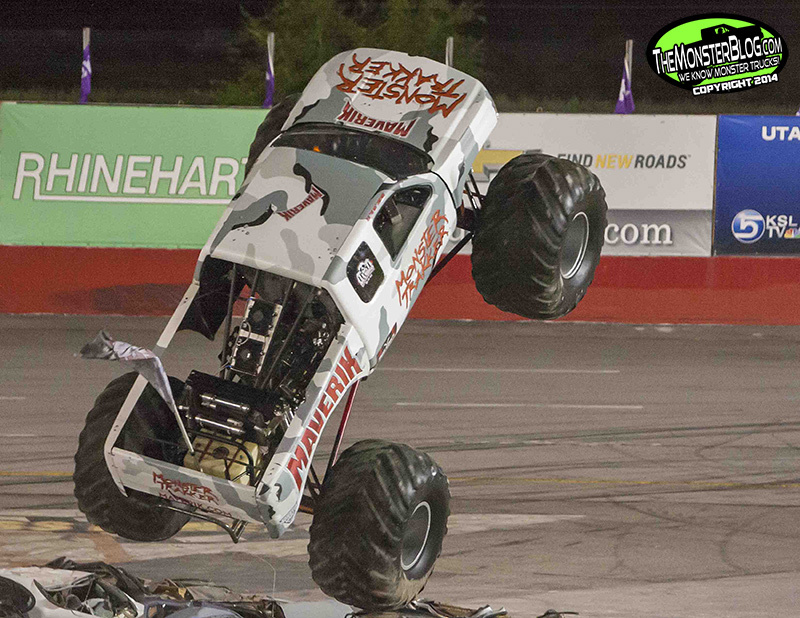 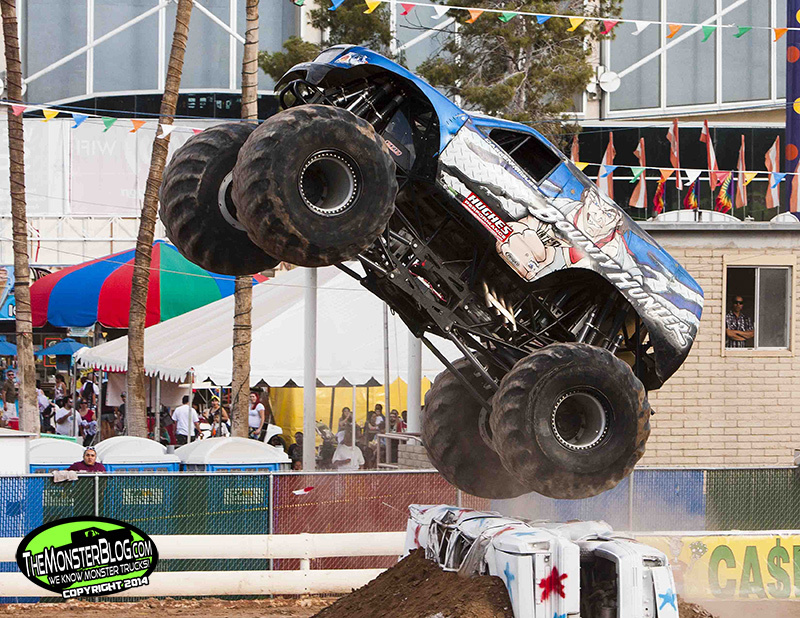 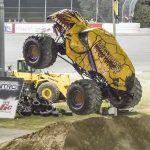 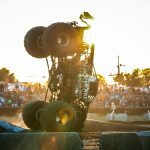 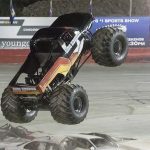 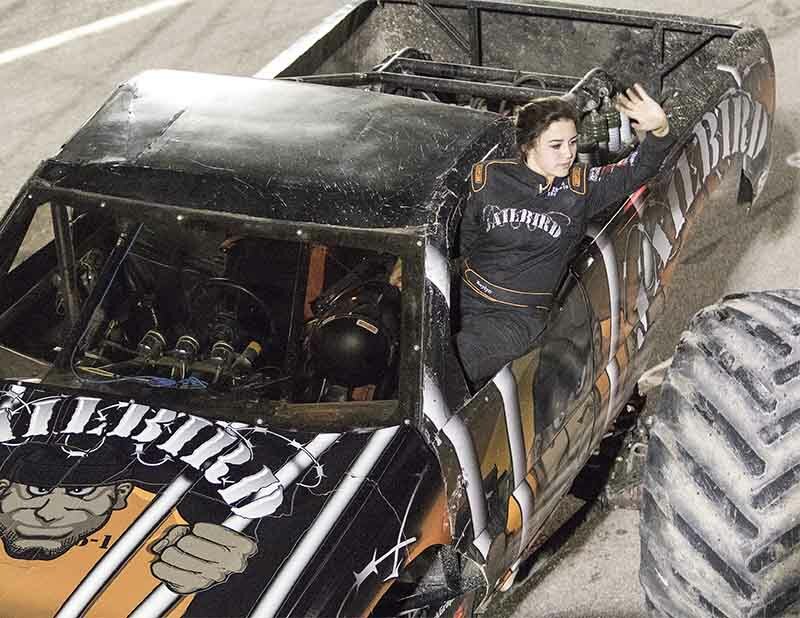 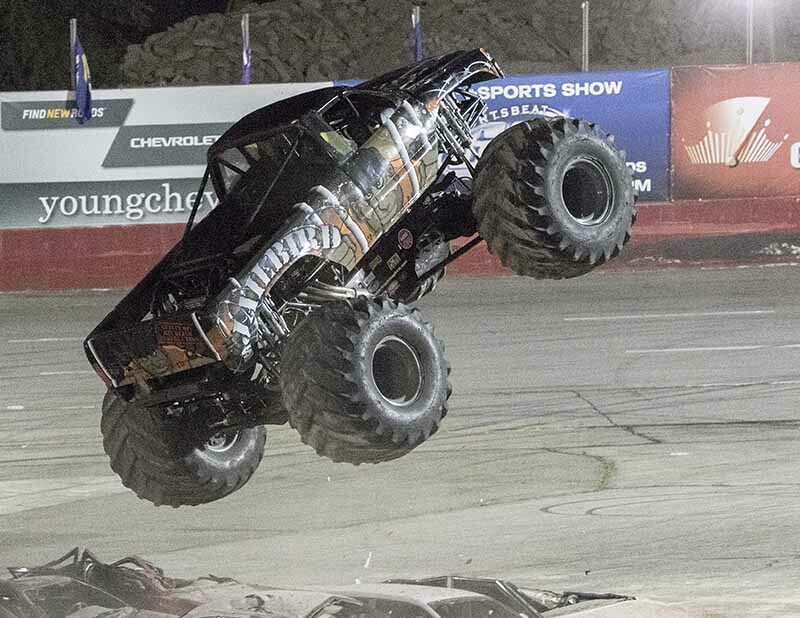 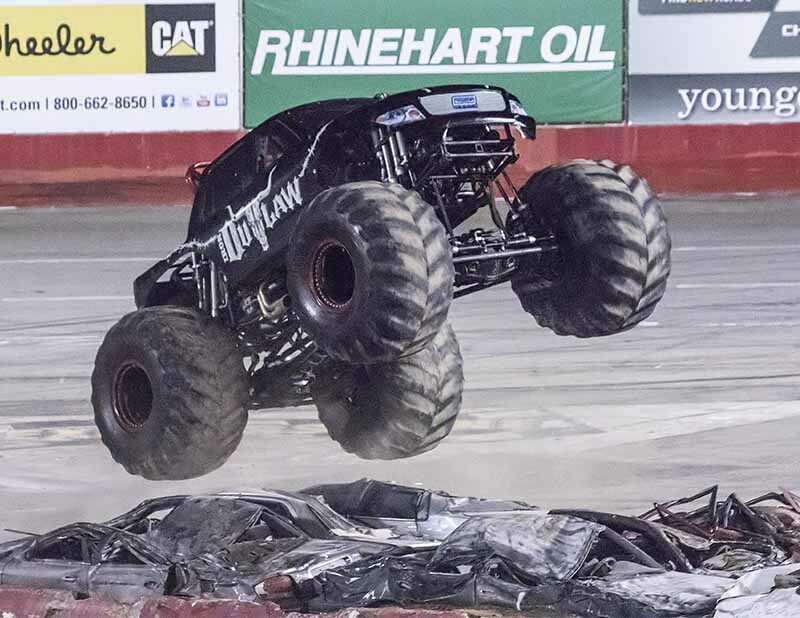 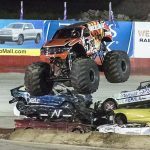 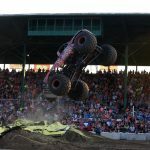 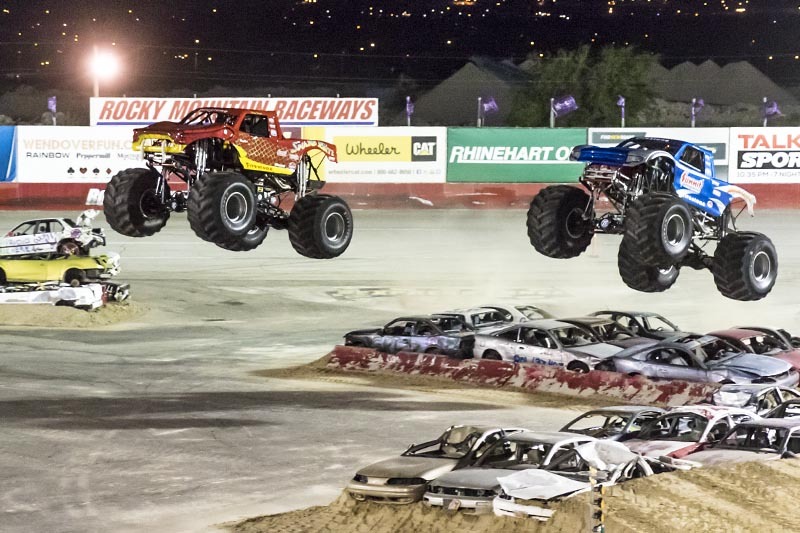 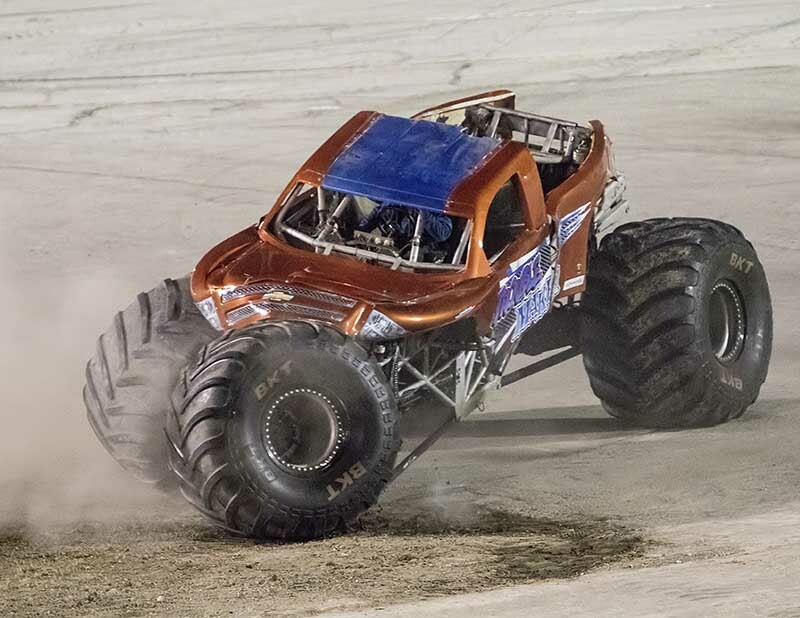 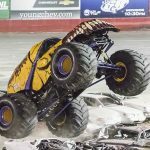 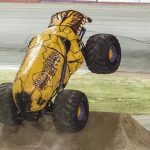 You’ll see that next week as we catch up on action from the end of 2013, thank you for reading, a grateful thank-you to All-Star Monster Trucks for hosting these great events, enjoy the photos and cheer on!